Hey, friends! Can you believe it? I can hardly believe it. Can you see me jumping up and down with joy? The day has finally arrived! Our kitchen is finally done. We’ve been actually using our kitchen since Christmas Day, but there were a few snafus along the way that slowed down the actual finishing work. So I’m super happy to say it’s officially done (well, you know, done for now! Is any room ever done?). 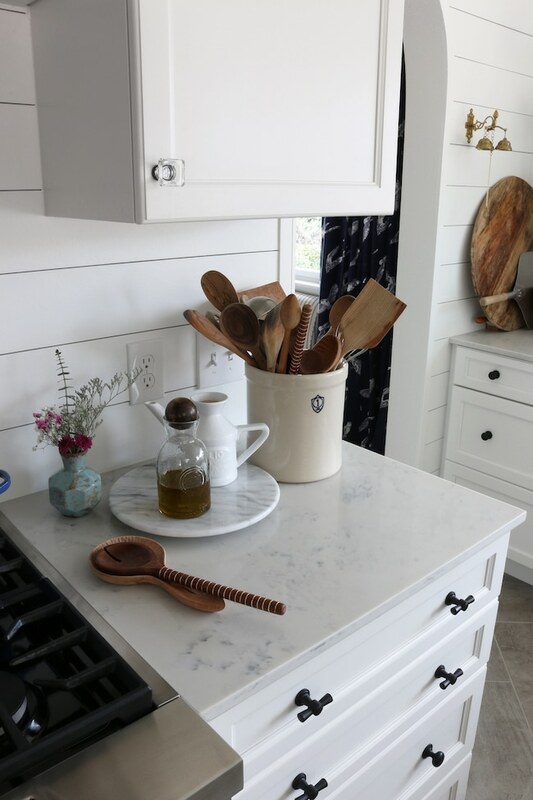 Because there is SO MUCH TO SAY and SO MUCH TO SHOW (yes, even in a little kitchen remodel there is a lot that goes into them) I will have to do more posts to share in greater detail on each of the elements. 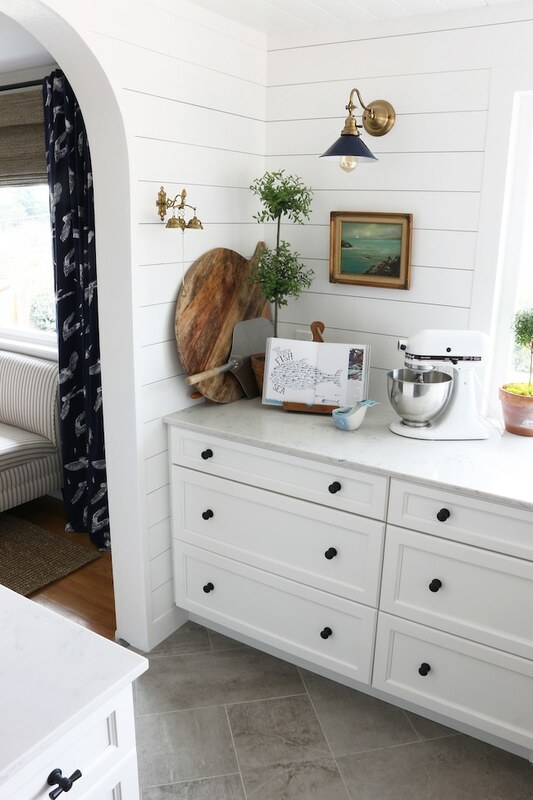 There were many design decisions that went into this small kitchen, but today I’ll at least be able to give you the overview and an overload of photos. So for those of you who want to read, you’ll find some commentary throughout. But rest assured, I’ll come back around to each of these elements in more detail in future posts. So if there’s anything I didn’t explain or questions you have, feel free to ask in the comments! As a brief recap on this house (for those of you who are new or need a refresher), we bought this house in Seattle one and a half years ago. The housing market was (and is still) crazy in this area, so it felt like a miracle that we were able to get a house at all. While we almost didn’t even look at this one, we were glad we did because it had some strong selling points. Mostly we loved that it was a super solid house with beautiful views of the Olympic Mountains, Puget Sound and the sunset out over the backyard. It was a very cloudy day when we took these pics so you won’t be able to really see the view, but I’ll try to get more view photos another day. 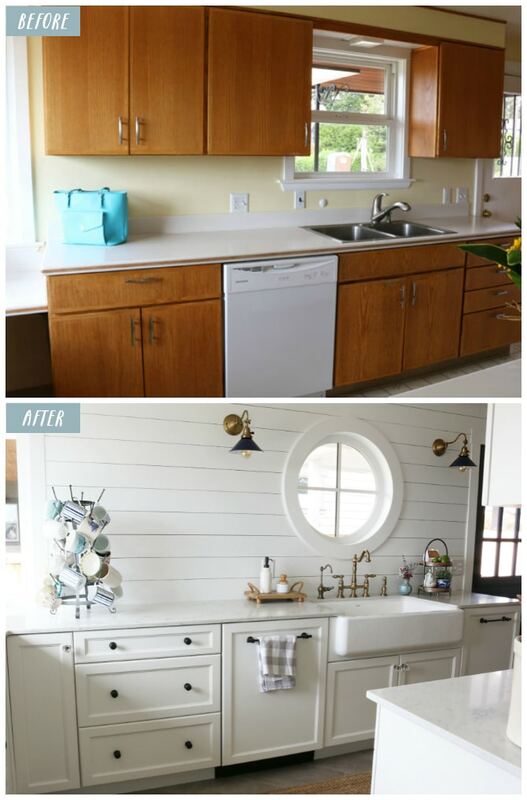 You can scroll to the end of the post for before and afters. 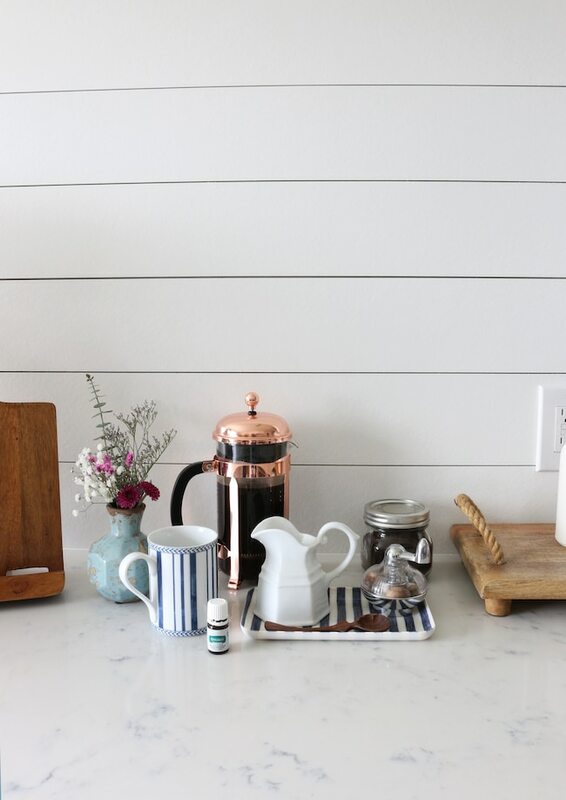 The house had been updated about sixteen years ago and so lovingly maintained by the previous owner, but it was ready for a kitchen update. 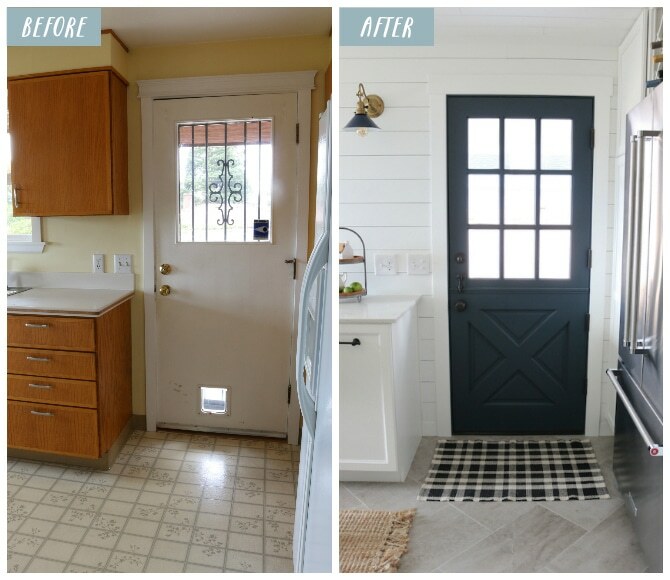 We considered all sorts of options for how to approach a kitchen remodel, but we ultimately made the decision that the best plan was to demo the existing elements but leave the basic layout, location and size as it was. I know it’s sometimes ideal to remove walls for a more open floor plan or larger kitchen, but after living with our small kitchen now for about 8 weeks I have to say I’m SO glad we didn’t remove walls. I really LOVE working in this kitchen. It’s is so functional and has a really comfortable layout. 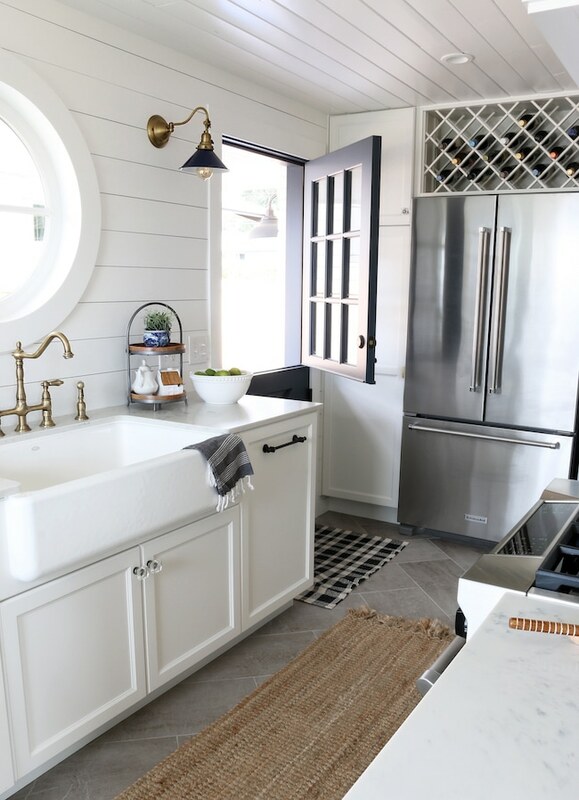 Plus there is enough room for family or guests to help cook and clean up, too. The not-totally-open kitchen also keeps the dinner mess pretty much out of view from the main living areas. :). I prefer that! 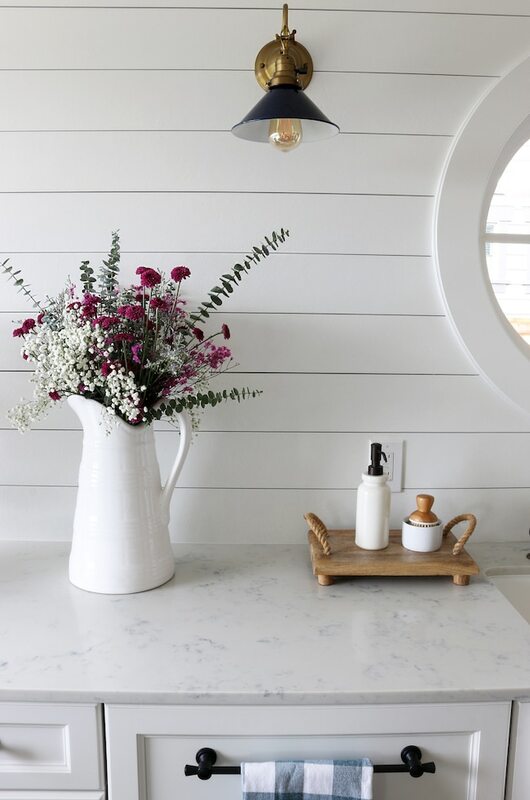 We did make a few intentional changes to the space that made a dramatic difference in how the space feels and is perceived in the house. 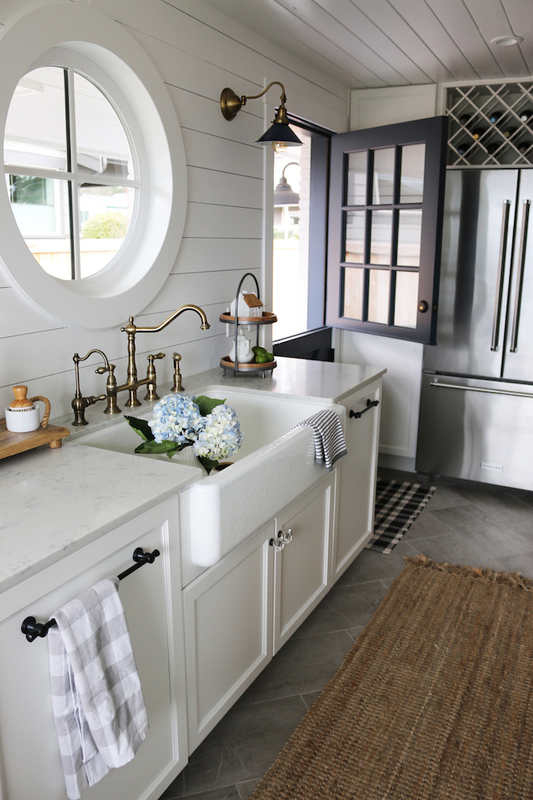 With a relatively small kitchen (small compared to LARGER kitchens, of course), you can’t always add in some of the usual go-to design features like a cool island (or two) or a row of awesome barstools at the counter or an amazing dining table. 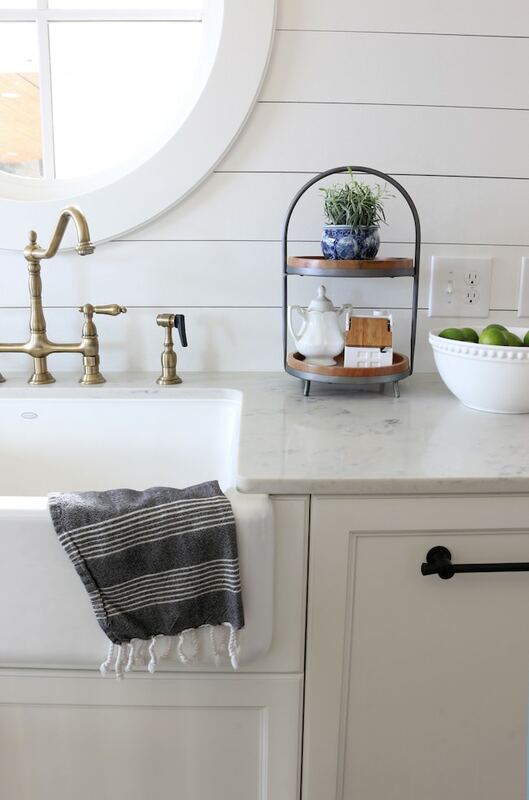 Because the wall and floor area is usually so limited in a small kitchen, you have to make every design decision count without any one of them overwhelming the whole. 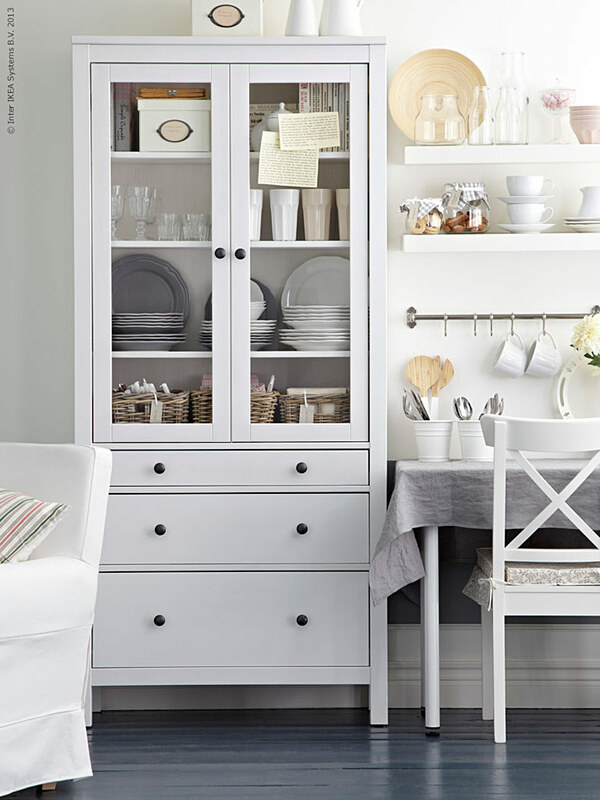 But on the plus side of a small kitchen, you get to make a big impact with less. 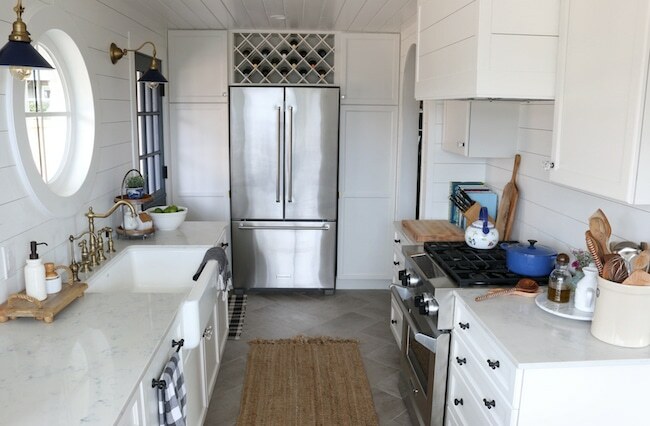 Not only is this a small kitchen, but it’s in an old house! 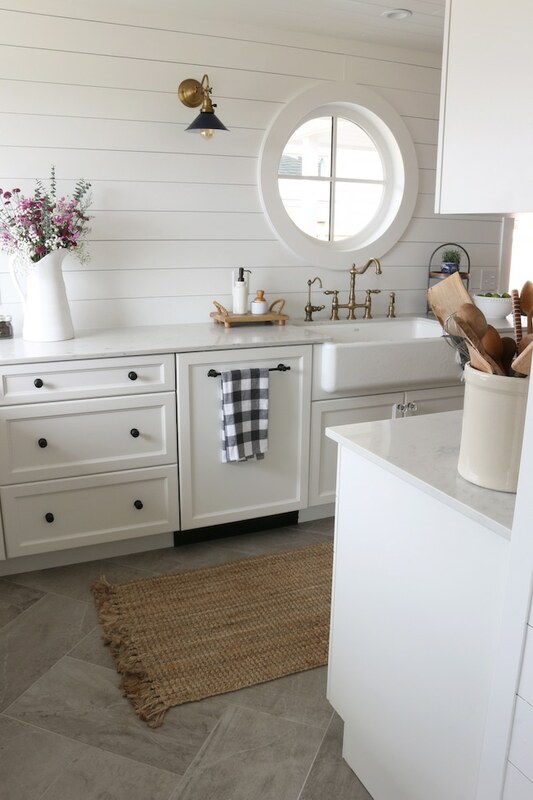 I wanted the kitchen to have lot of personality, but needed to honor the original space and tie in old house character with the new elements so they work together to complement the feel of the whole house. 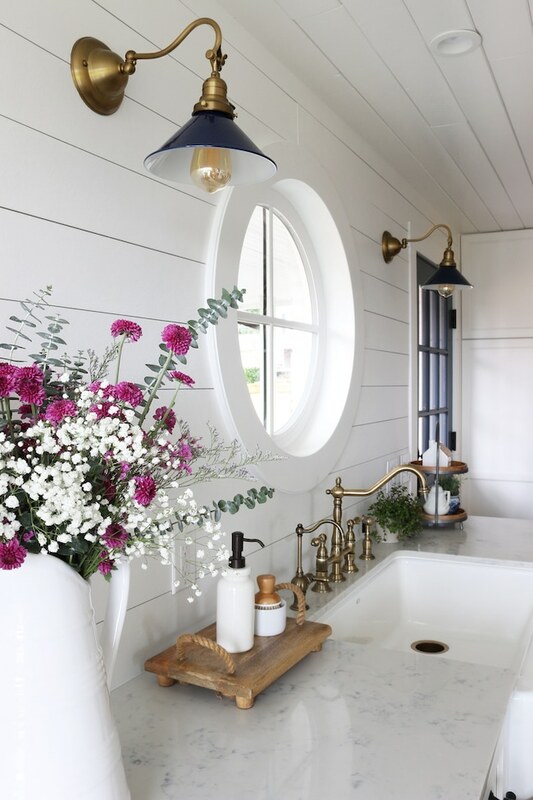 I wanted the room to be flexible, so a neutral palette would let me change the look and feel easily through the seasons, too. This is an antique dinner bell I’ve had for years! 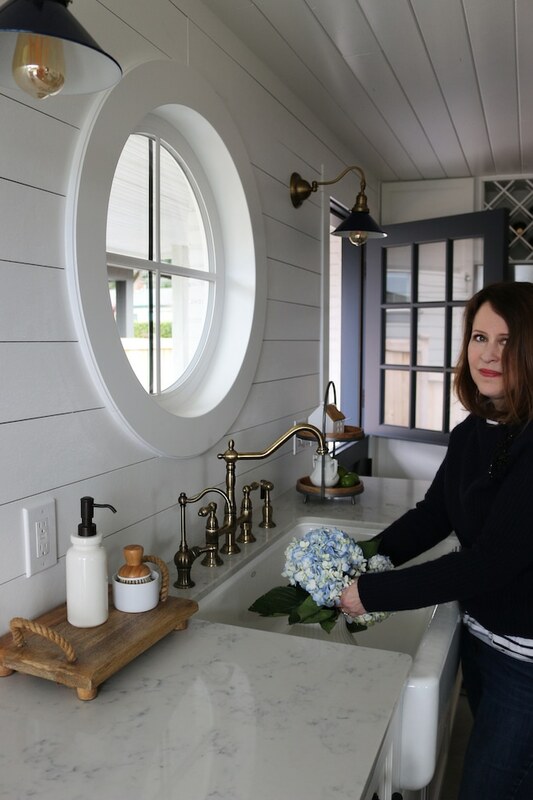 As I’m showing you around, I’ll share a few of the highlights on the main features of this remodel. 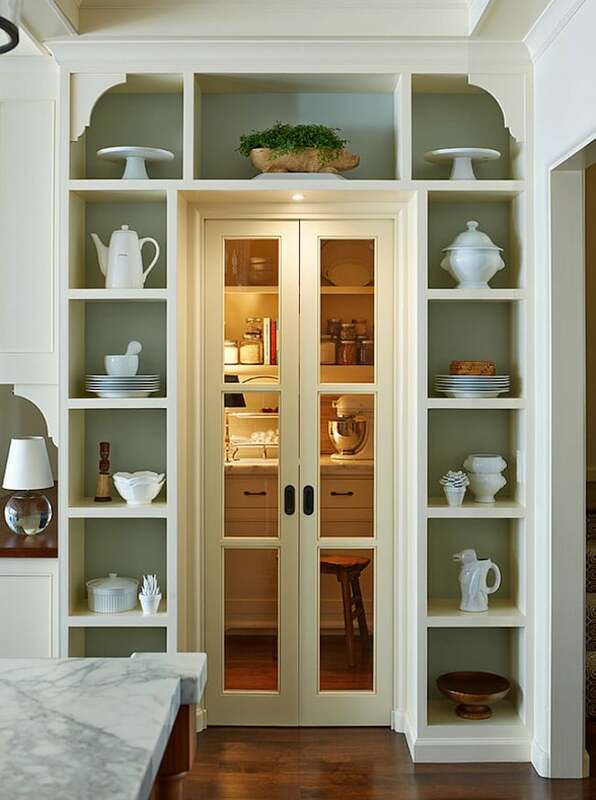 The two small existing doorways were demoed and altered to be open rounded/arched openings. 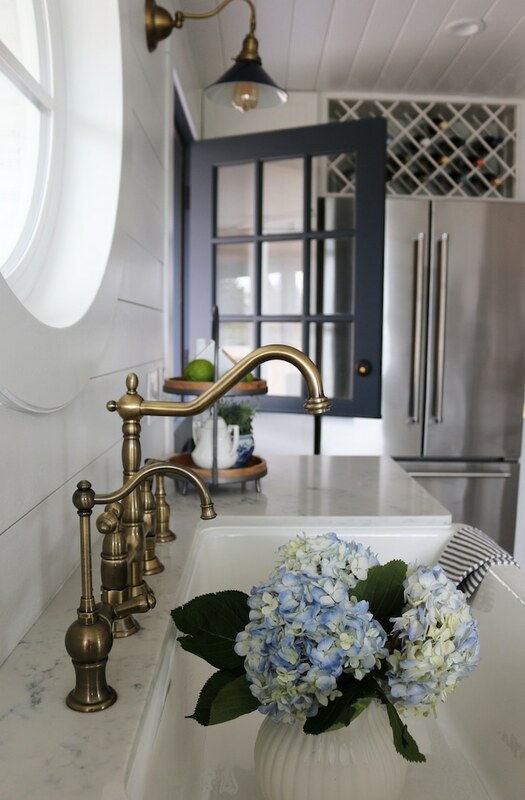 Besides adding some additional character to the house, the arched openings added height and make the kitchen feel like such an inviting destination. You can’t help but want to go see what is through the arch. 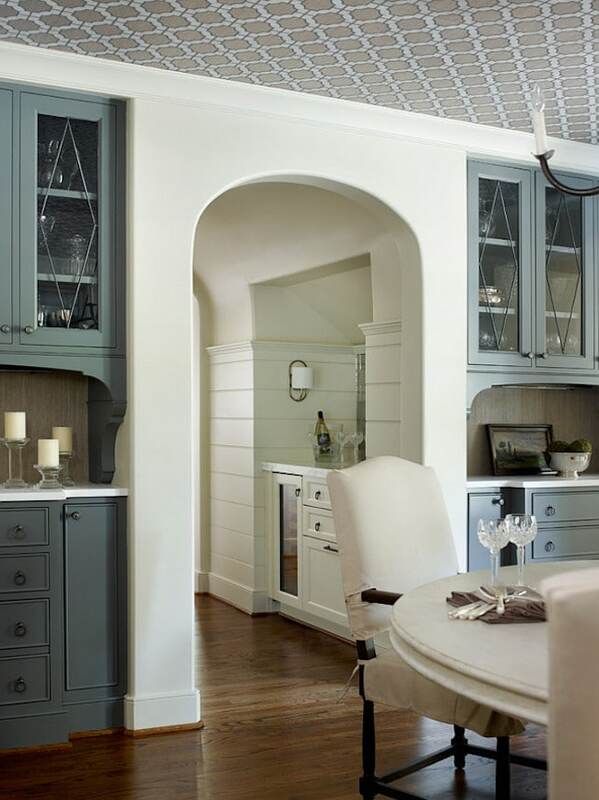 The arched opening provides a more welcoming connection between the dining room and kitchen, too, and both spaces now feel extra charming. 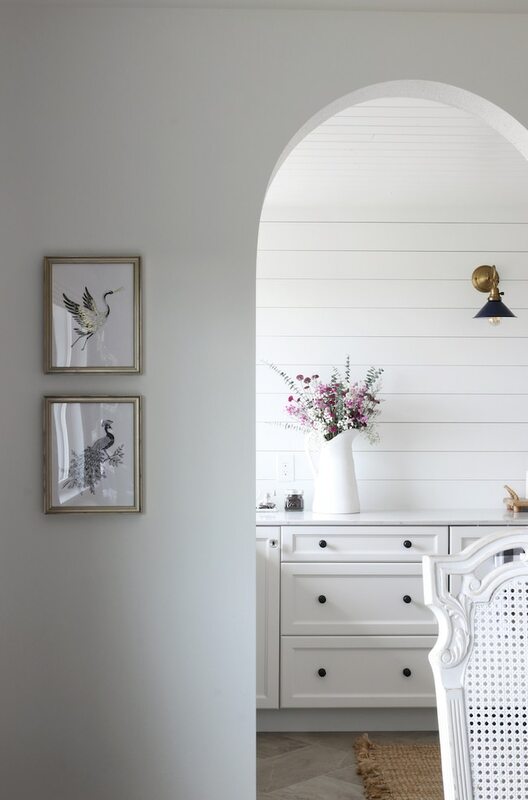 The paneled walls make this room feel really solid and the horizontal texture is a pleasing visual connector to all of the elements in the room. The ceiling is covered in tongue and v-groove cedar planks with visible knots. 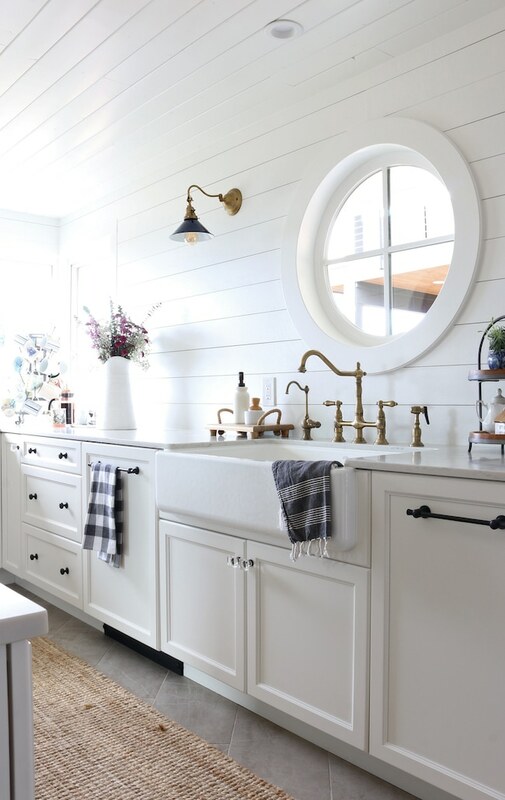 The wood planks wrap the whole room in chunky wood which definitely adds a lot of warmth and character, too. 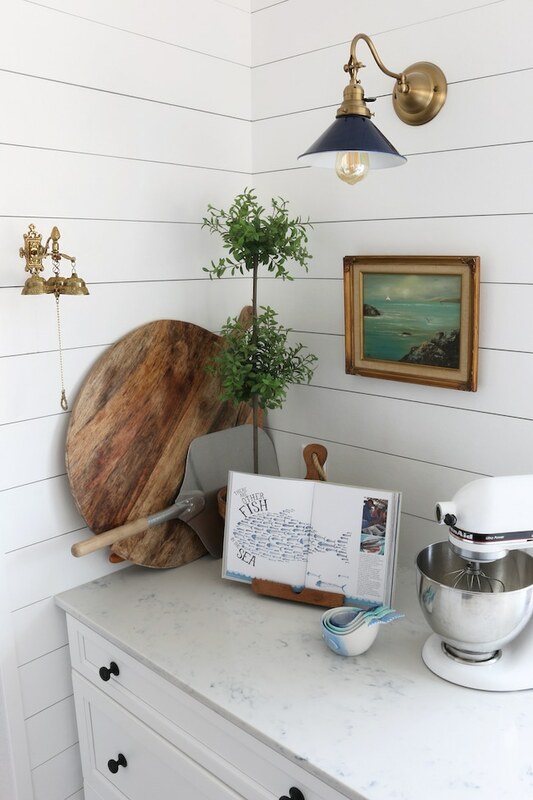 I wrote a post all about the shiplap-style walls here. 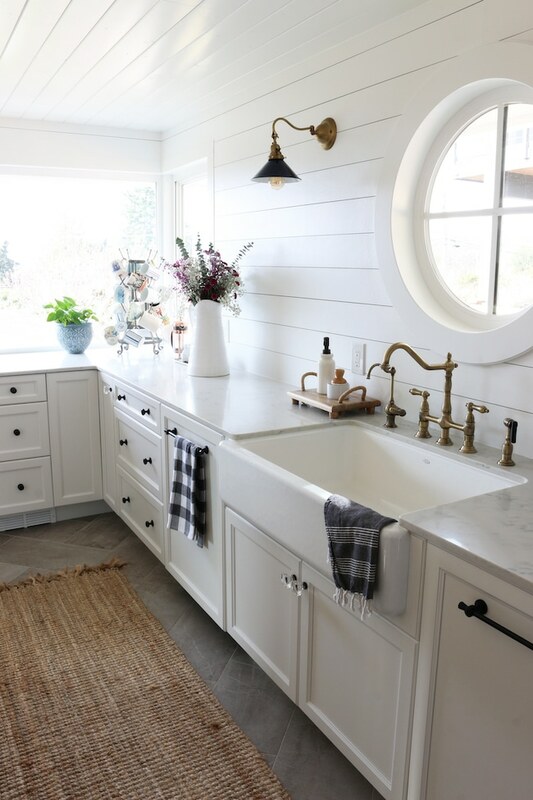 In addition to leaving the original placement of the appliances and corner windows, we also left the placement of the sink. 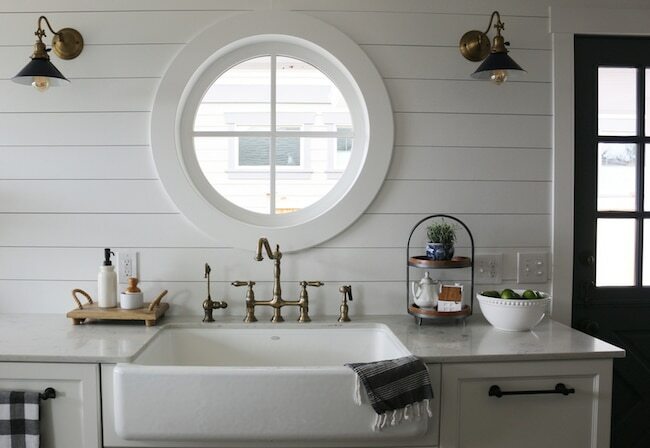 We decided to switch out the existing window above the sink area for a round window for a few reasons. 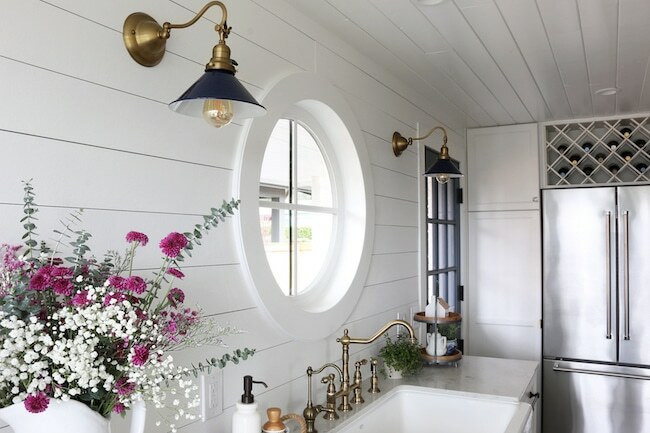 Not only is a round window appropriate for the house, it was a nice complement to the arched doorways. 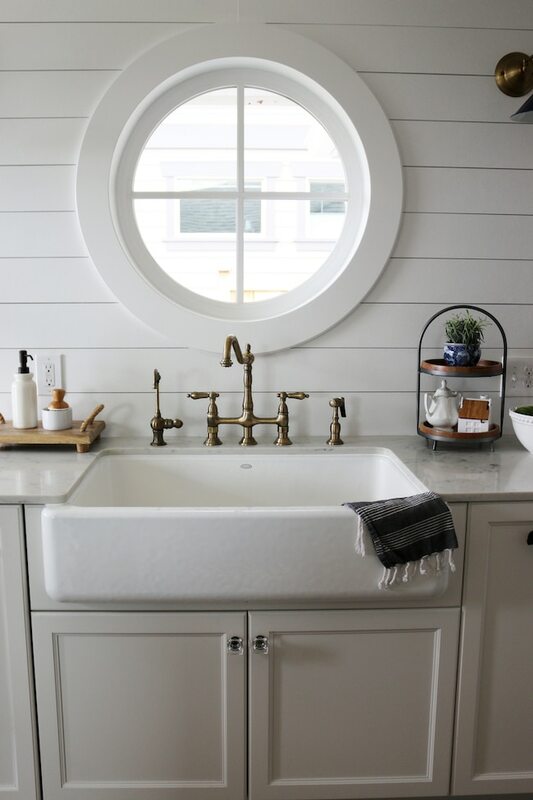 The round window created a really nice focal point for the sink area, but painting the woodwork white keeps this area from visually overpowering the view out the back window, the “other” important focal point you notice and can enjoy while you’re in the space! 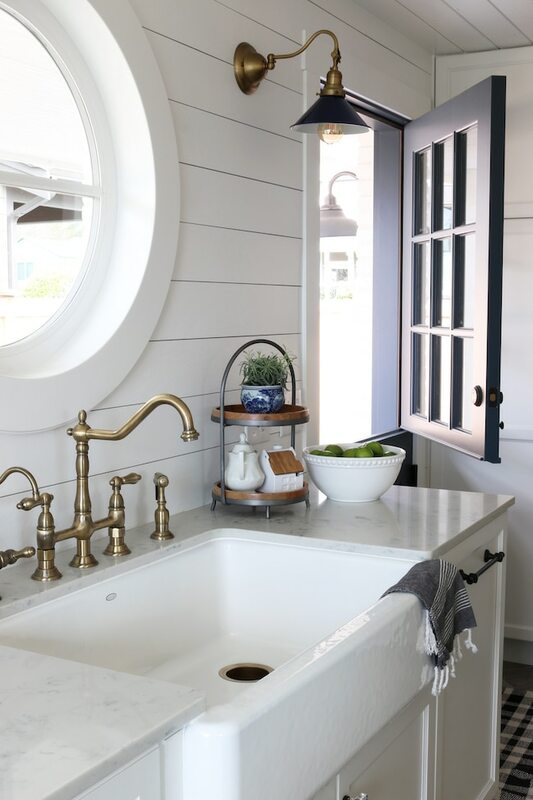 The sink area definitely deserves attention, though, so the sconces and antique brass finish faucets add a soft metallic shine to make this space feel extra special, too. 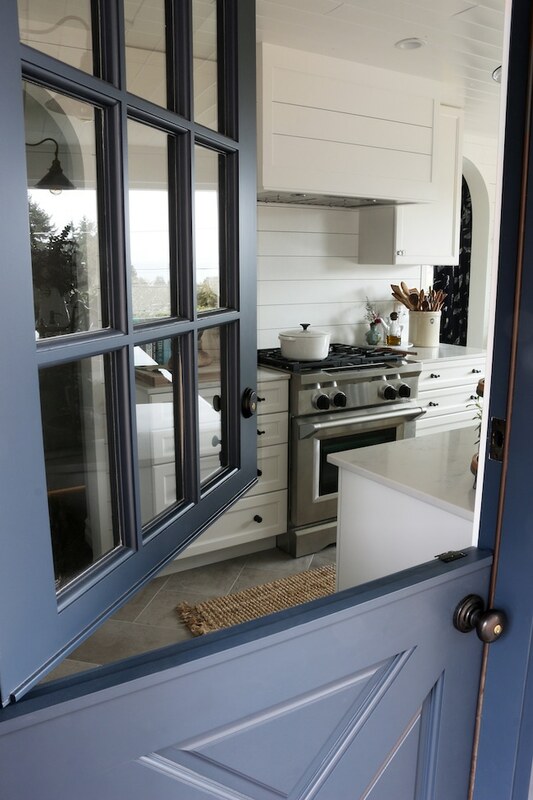 Oh, THE DUTCH DOOR! How long have I been talking about this door? I can hardly believe it’s here. I open the top part every single day, snow, sleet, rain or shine. This door pretty much determined every other decision in the room. 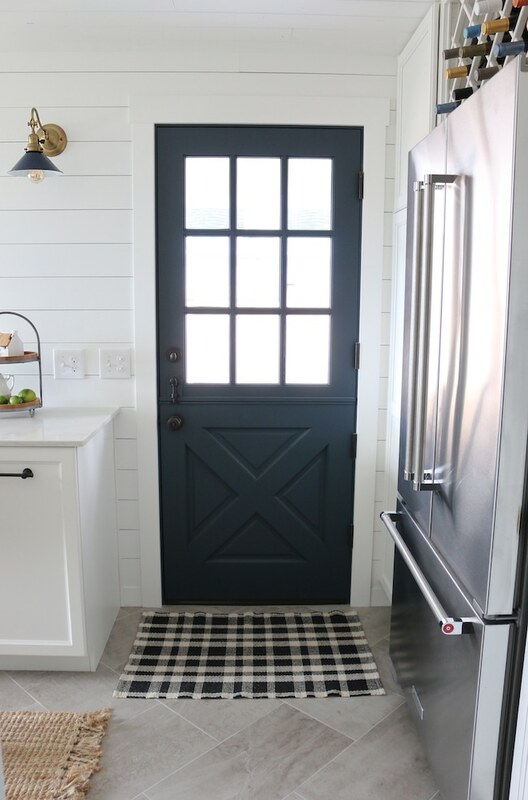 I had dreamed up various design options and colors for this kitchen, but the one feature I just really felt drawn to the most was a dark moody navy Dutch door. So, the door gets to steal a bit of attention in its own way! As it should. 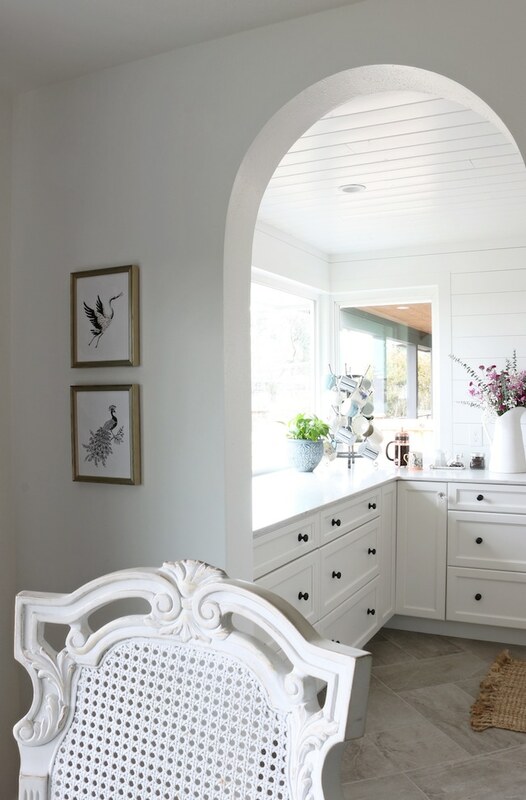 I love the contrast to the white, and that adds its own touch of coastal cottage personality to the space. 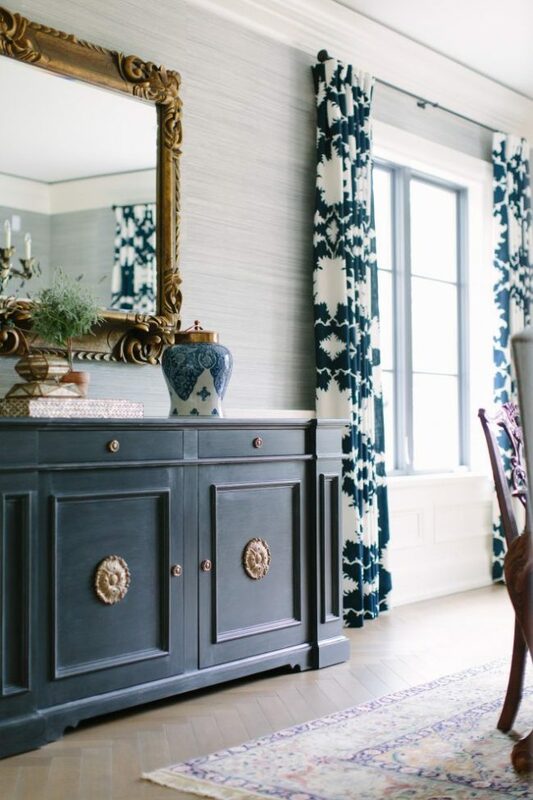 The paint color is Blue Note by Benjamin Moore. 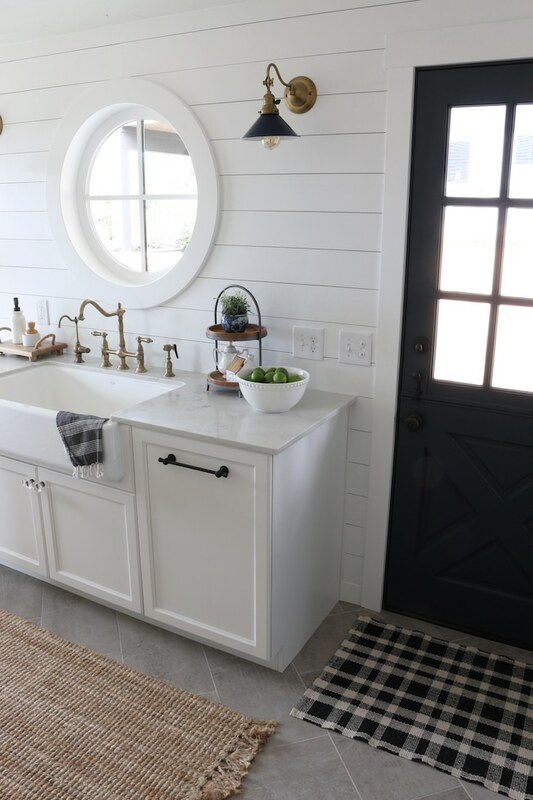 The plaid rug is from here. 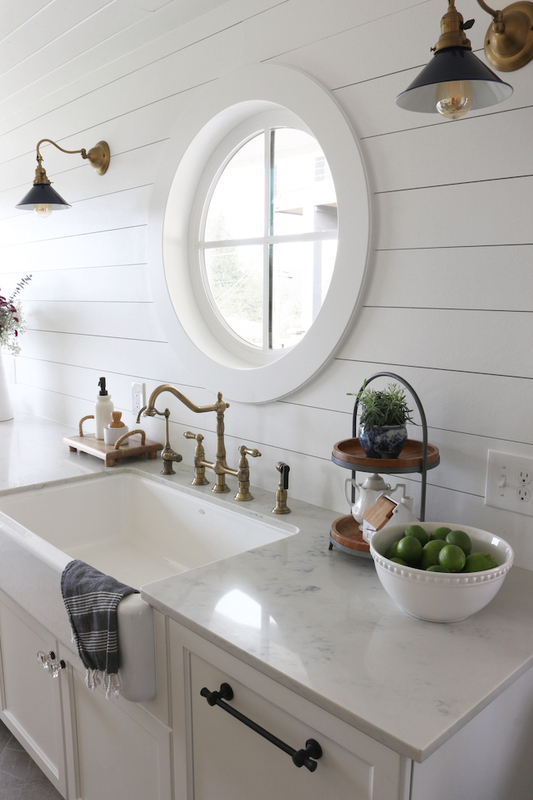 You’d think with a smaller kitchen we’d want a smaller sink, right? 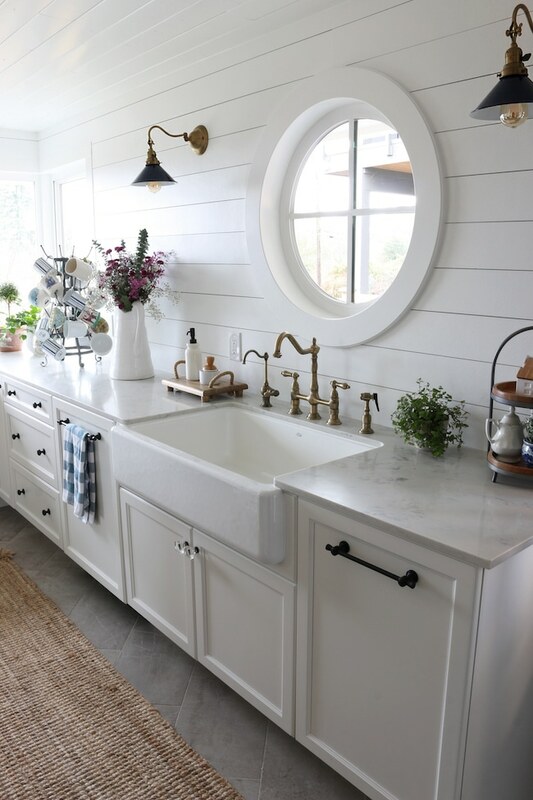 I decided to get the same sink we had in our old house, yet this time we actually got a slightly bigger one! In our old house we had to modify the existing cabinet, so the 30 inch sink was the size that fit. 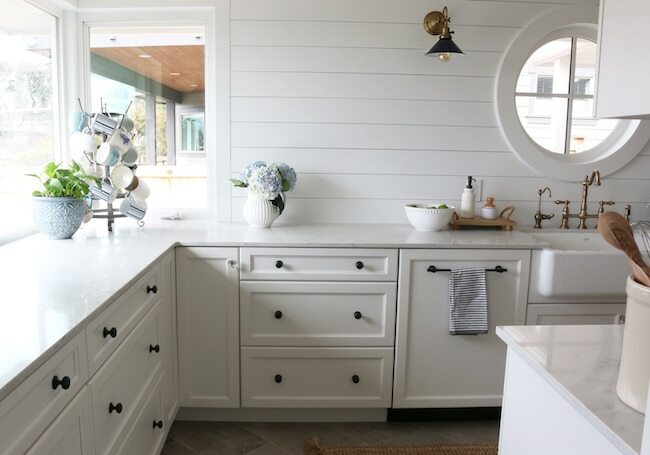 In this kitchen we were getting a brand new cabinet, but the cabinet size that fit into the space would accommodate a 36 inch sink (the cabinet is slightly bigger than the sink). I was worried it would feel unnecessarily big but it doesn’t at all. 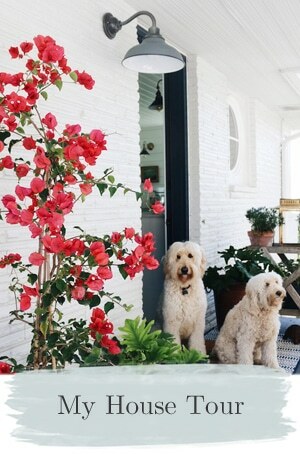 It’s the right proportion for below the window and is wonderful for watering plants and washing pots, pans, baking sheets. 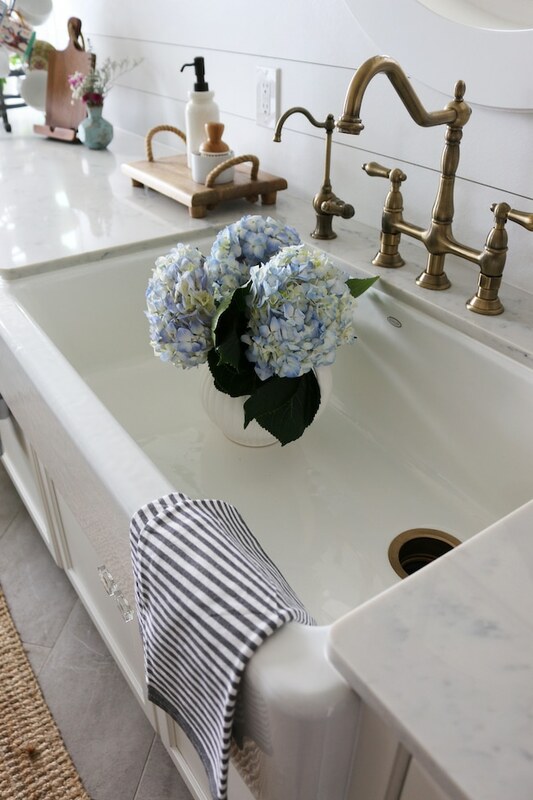 As a shorter person, I love undermount apron front sinks because they are so easy to reach into to clean and do dishes! 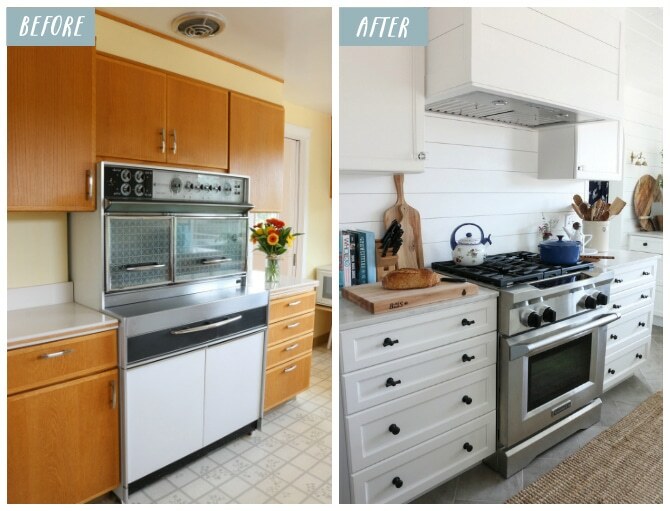 In addition to a new look, this kitchen really needed more function. 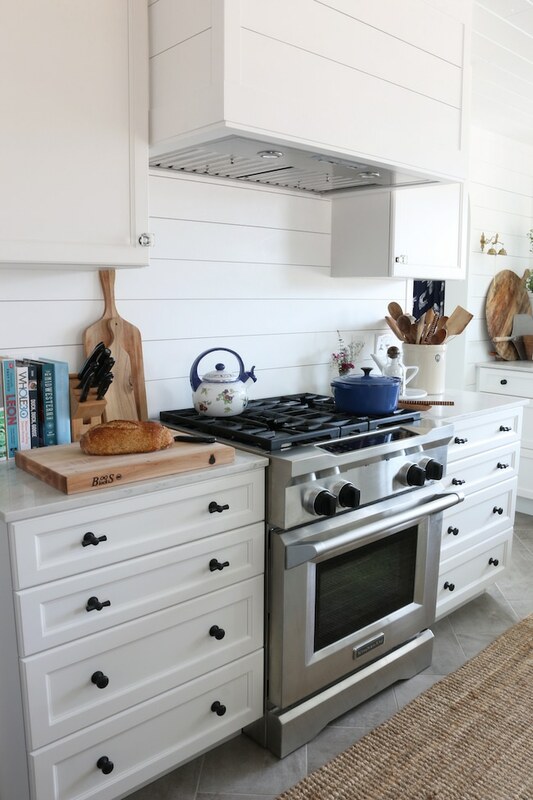 We toyed with the idea of having custom cabinets for this kitchen but we ended up with a company that customizes your order from a stock cabinet line. 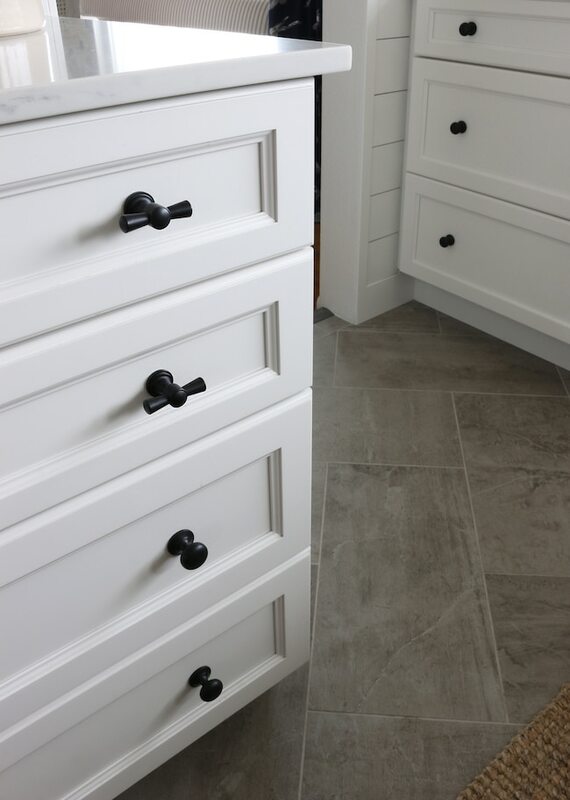 They are all soft close and full extending drawers (I’ll share more details on what all that looks like in a future post). 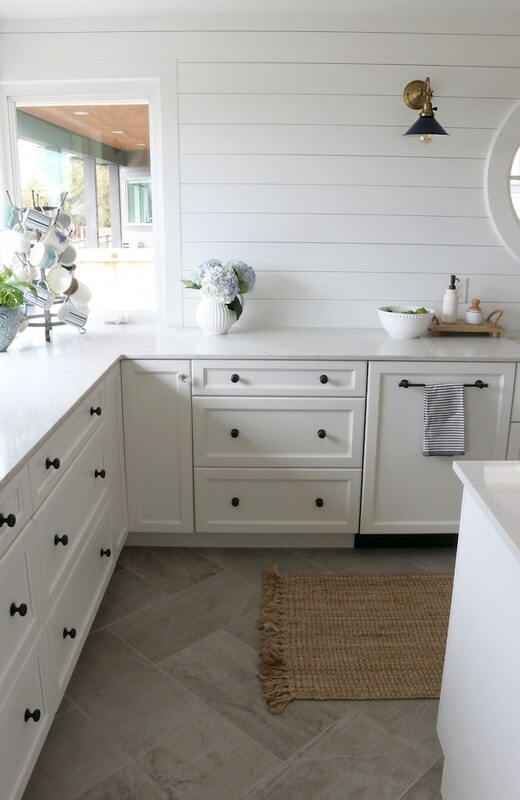 Our cabinets are full overlay (which gives you more storage, a big plus in a small kitchen) in the shaker profile with a subtle detail on the outer and inner edges of the drawers (so it would have some additional “shadows” for visual interest.) 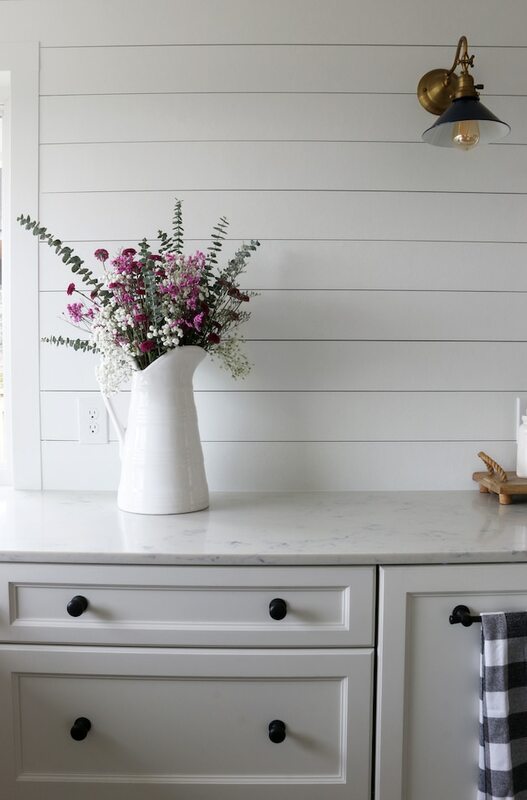 The color we chose for cabinets one of their stock choices, but it was the warmest white (very similar to to Benjamin Moore Simply White) in a matte finish. 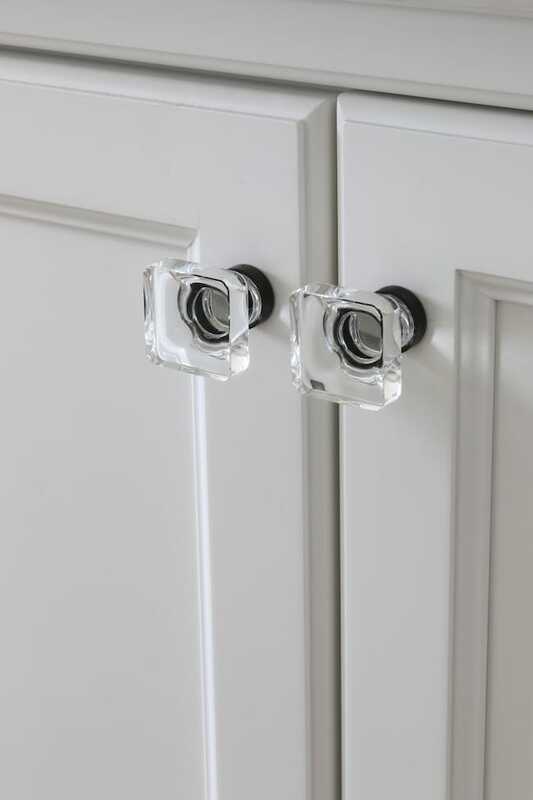 We were able to fit lots of new drawers and a really nice span of Quartz counters right under our corner window. 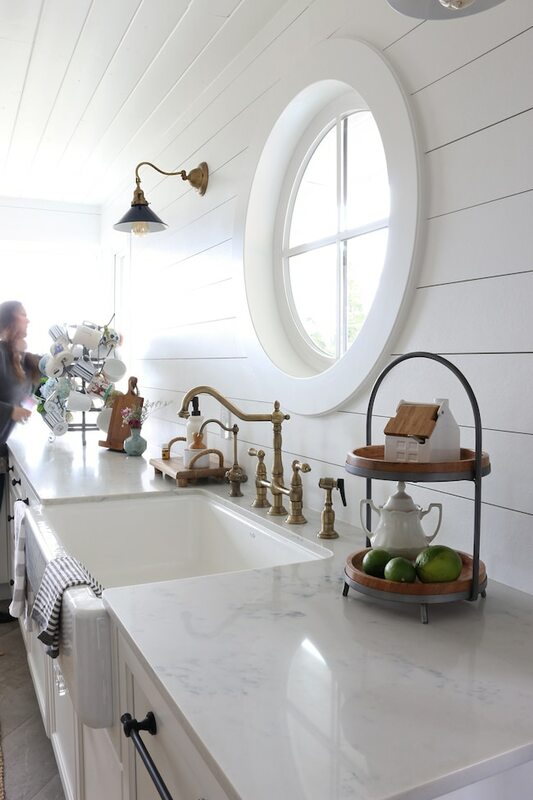 Our counters go right up to the window, making it pretty seamless and really easy to clean. 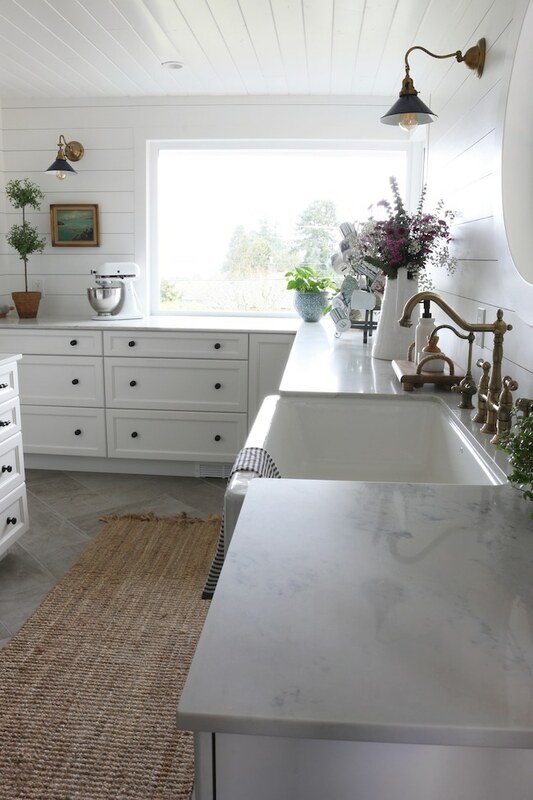 We used Daltile’s Quartz in Carrara Gioia. 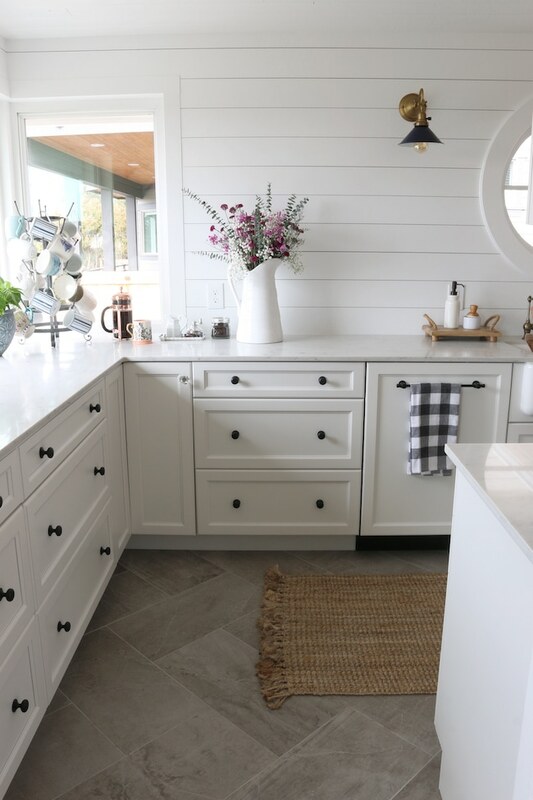 We added six drawers and a corner Lazy Susan cabinet on that back wall, so we gained a lot of storage and counter space from the previous layout. 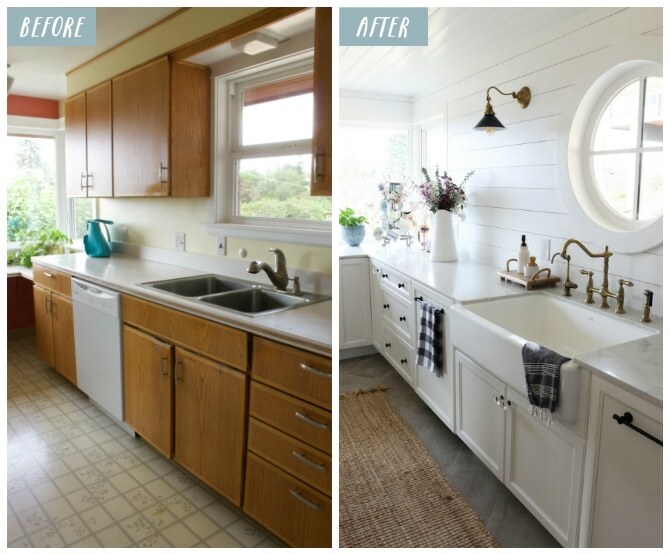 On the sink wall we added a set of drawers, a panel-ready KitchenAid dishwasher, and pull out trash and recycling bins. 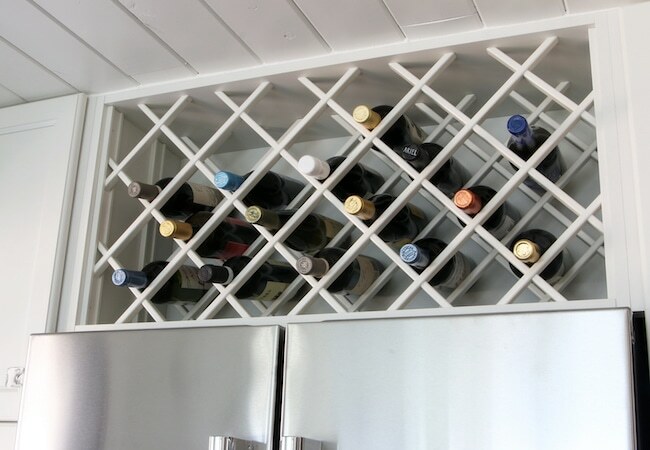 On the refrigerator side we were able to squeeze in two tall pantry cabinets with lots of pull out drawers, a refrigerator I absolutely LOVE, two upper cabinets and the wine rack (selected both for its fun diamond design element and the practicality of someplace convenient to put bottles!). This kitchen was like a little puzzle, every piece had to be measured exactly to make it as functional and enjoyable as possible! 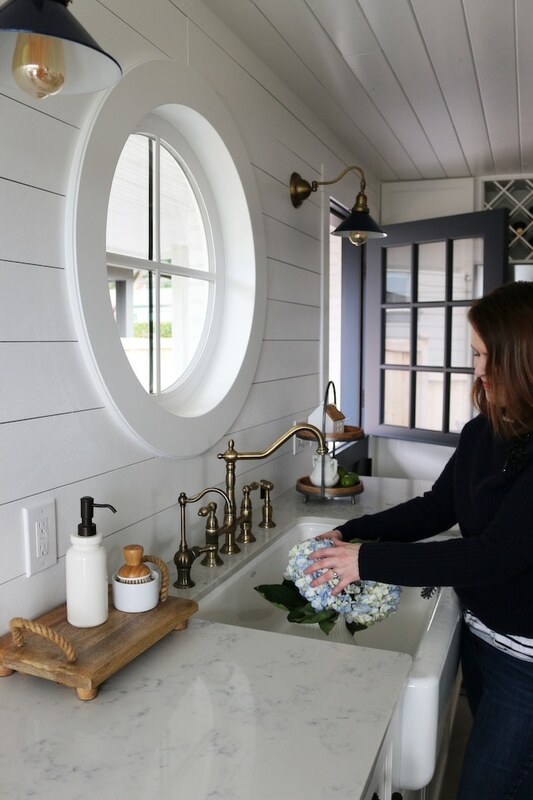 You might have noticed that we removed the upper cabinets from the sink side of the room to open up the full impact of the view of our corner windows. 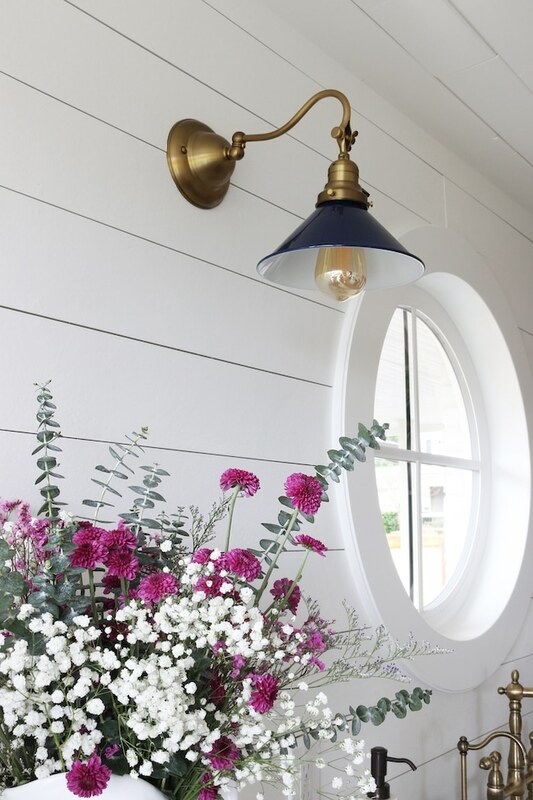 Having no uppers on two sides of the room allowed us to install wall sconces. 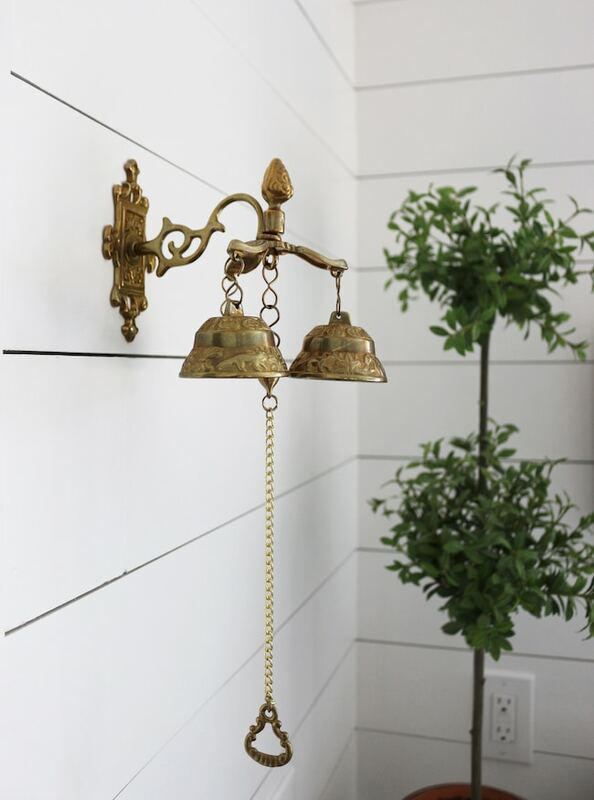 I put wall sconces in our last kitchen and they added so much ambience and warmth to the room. 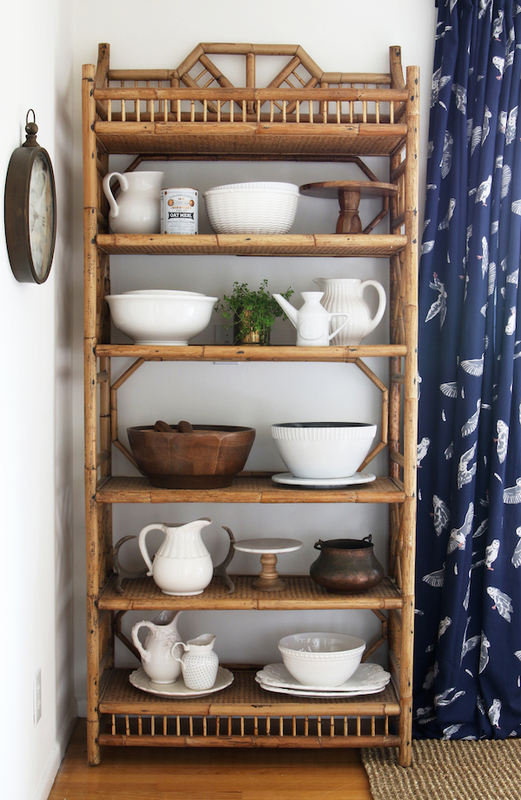 We originally considered adding open shelving to the kitchen, but it just feels so clean and uncluttered without it that I’m so glad we decided to not rush into that decision. 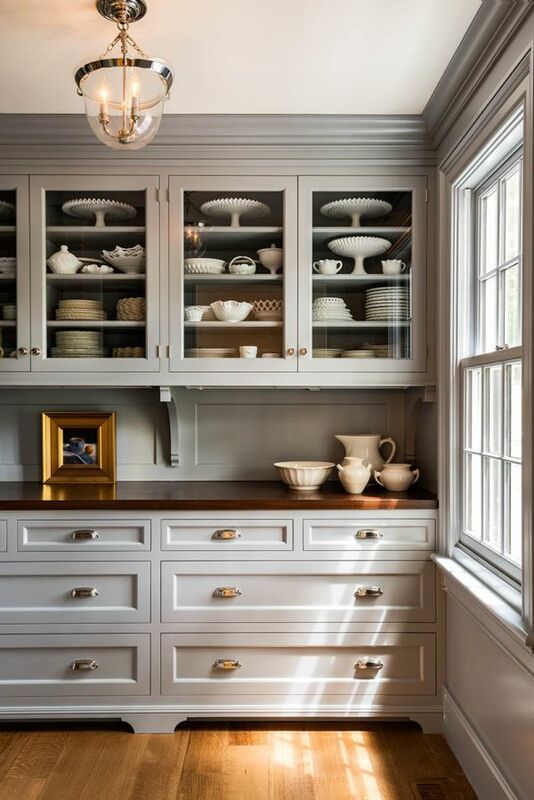 Tucking two closed upper cabinets on either side of the covered range hood provided a nice balance to the corner windows and additional storage for those necessary but usually unattractive pantry necessities. 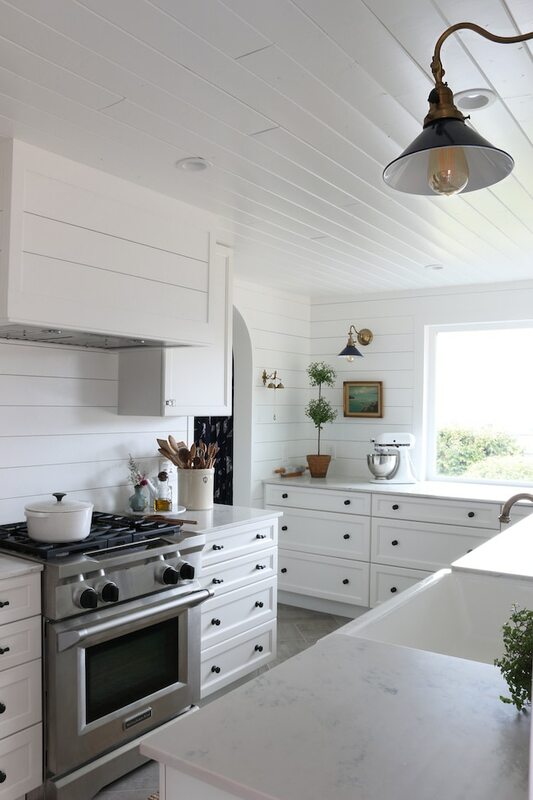 Our range hood (KitchenAid) has lights underneath it, so we also love that the mood lighting wraps around to that side of the room. 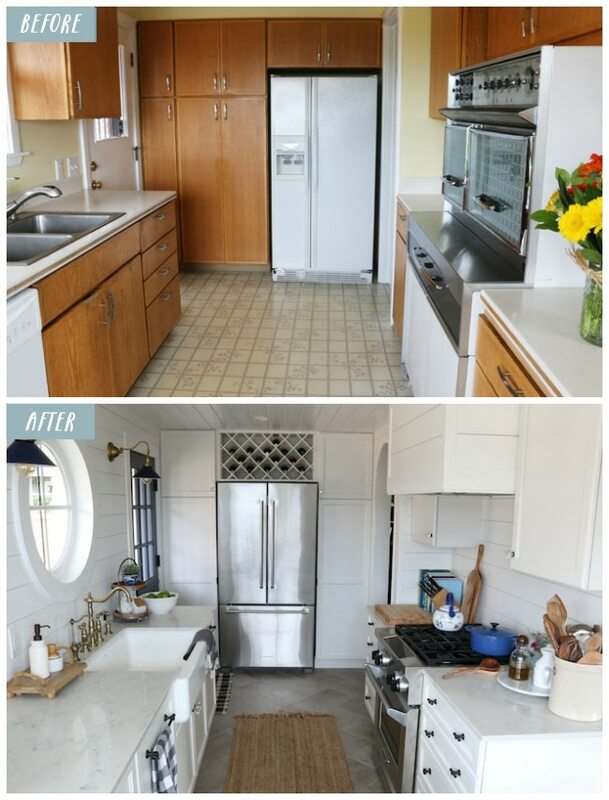 We did not change out our appliances in our last kitchen remodel, so it was such a joy for us to partner with KitchenAid to install new appliances in this kitchen! 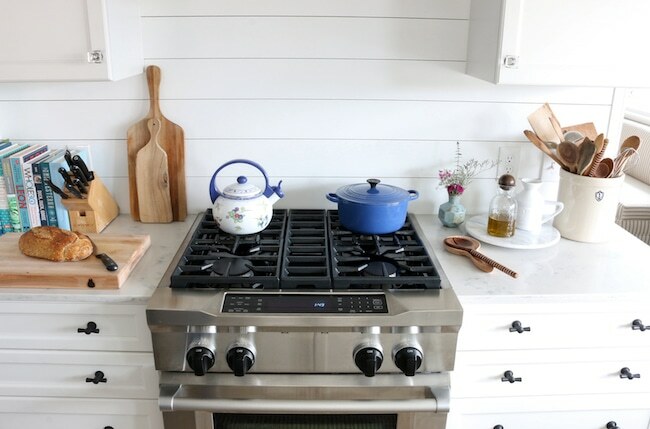 I can’t even tell which appliance I love the most, they are all incredible. 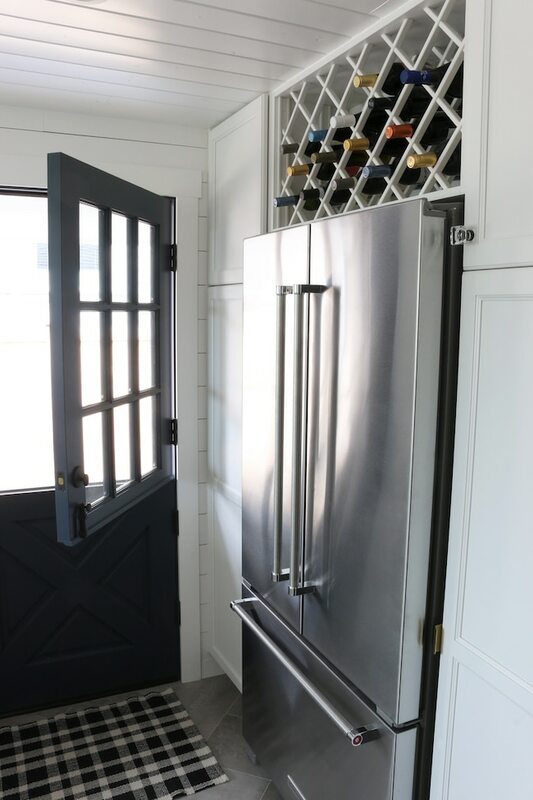 I’ll put together a specific post on the appliances soon so I can show you my favorite features and the reasons why we selected each one for our space! 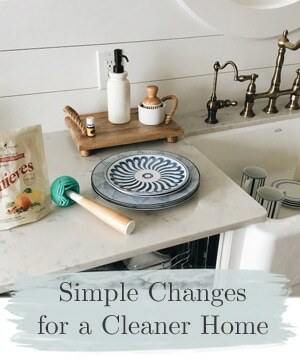 The professional range and range hood, the French door cabinet depth refrigerator, and the paneled dishwasher make meal prep and clean up a dream. 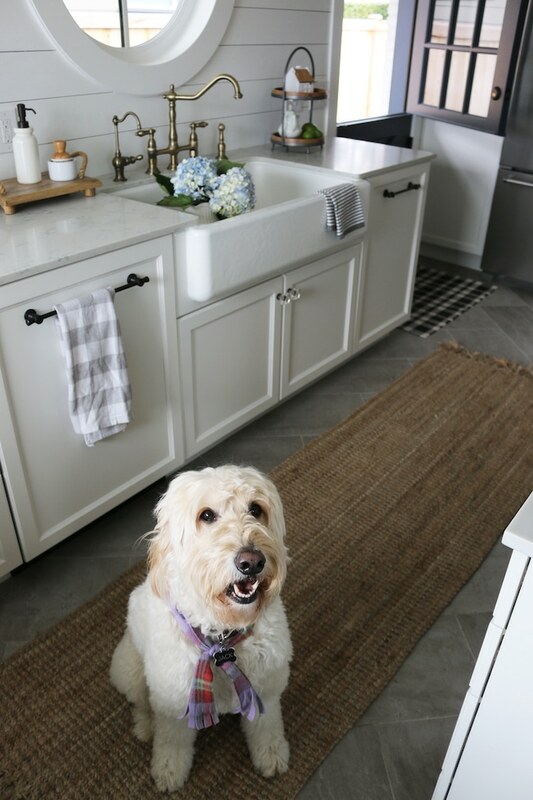 The floor selection was another long drawn out decision (you’d think in a small kitchen everything would be easier, but it wasn’t). We also had to consider the adjoining spaces. 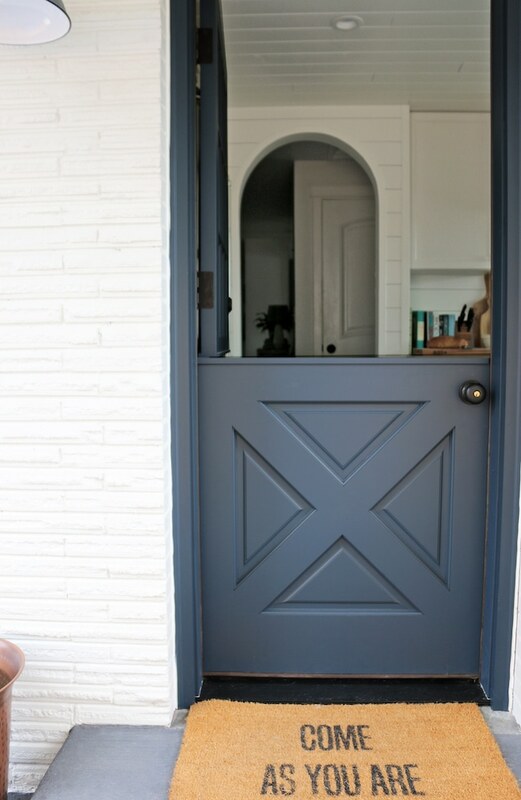 In the end we decided to go with a durable almost concrete-looking tile (it’s from DalTile). 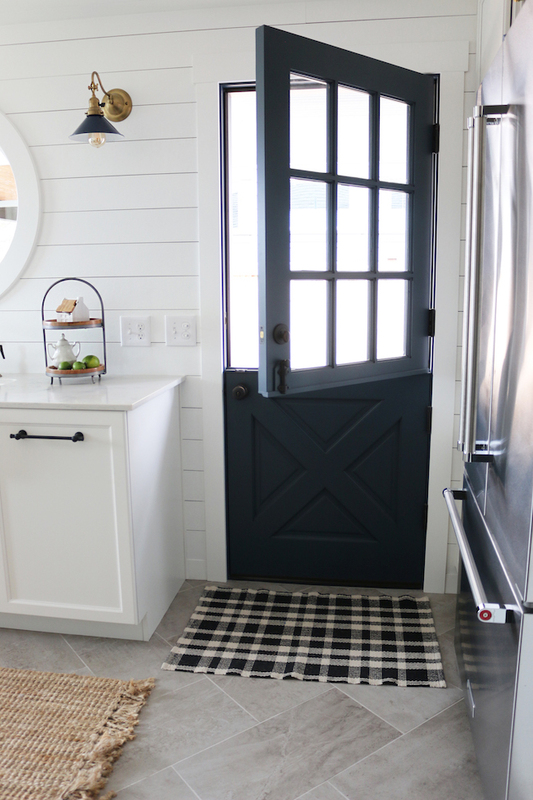 It has great texture, so it’s practical for our dogs coming in and out of the Dutch door. 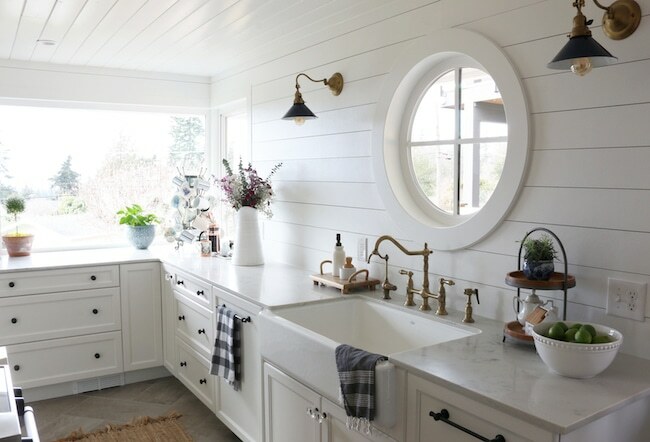 It also gracefully hides a lot of daily grime that tends to happen in a small kitchen. 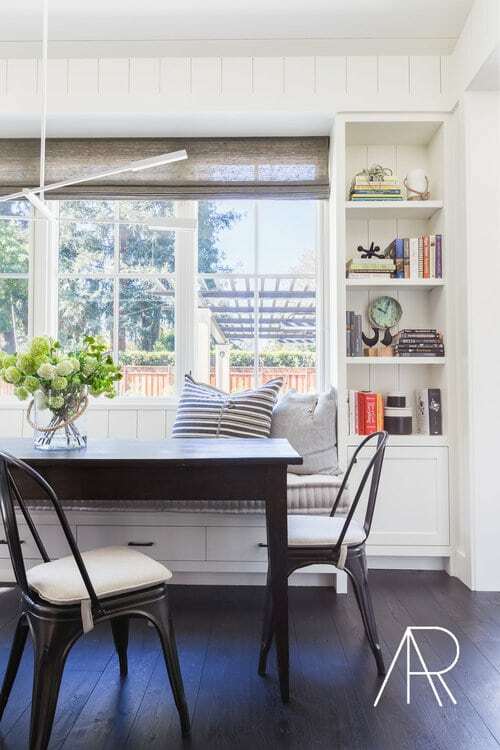 The brownish gray hue is strong enough to provide an additional contrast in the room, too, without calling too much attention to itself. I love it! Besides the immediate flooring material decision, I also really wanted the future option to use various runners (I really love having the option to make fun design updates on a whim! ), so we didn’t want too much design on the floor. 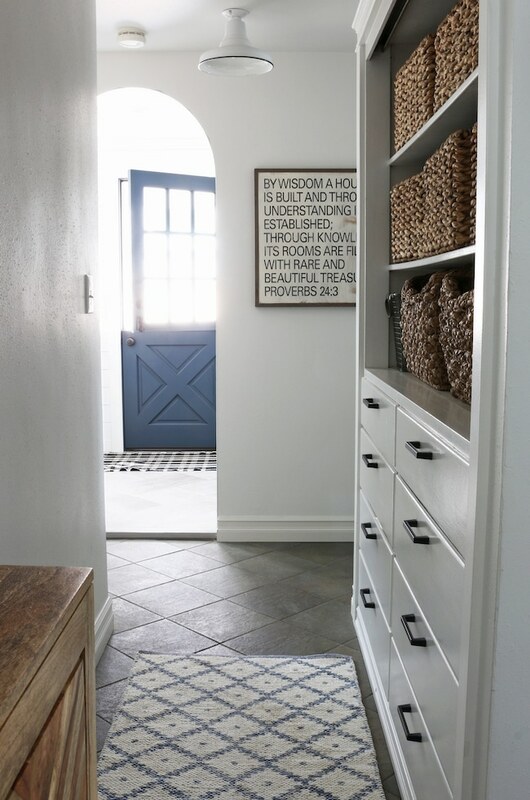 But we had rectangular tiles installed herringbone style for a little extra interest and movement. They are beautiful bare, too. I can talk more about the floors in a future post, but we’re really happy with them. 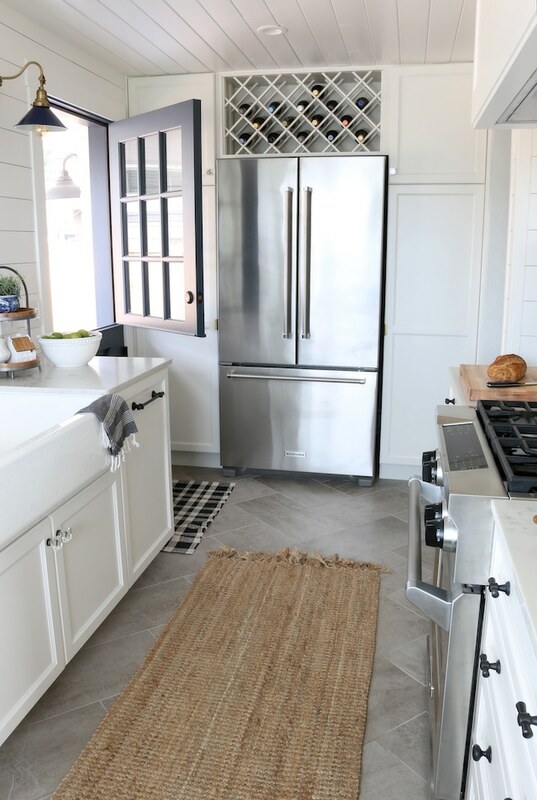 The rug we have in the kitchen is this one. 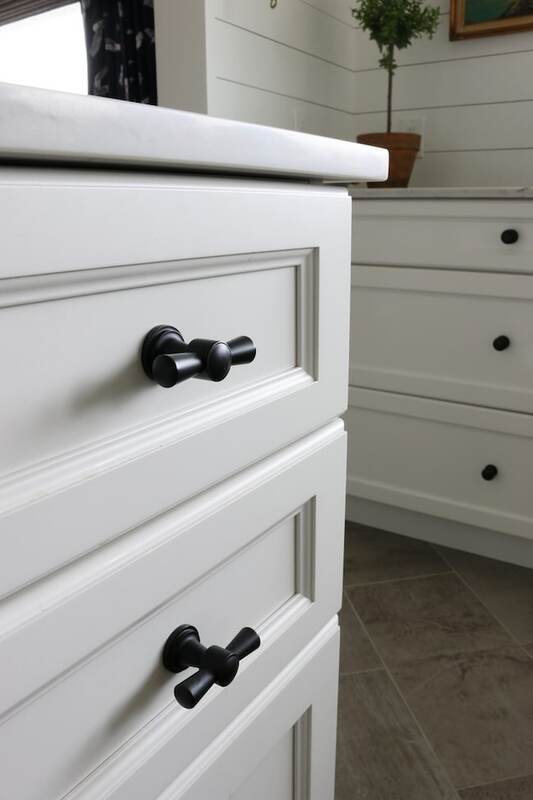 I love mixing up the styles and shapes of hardware and finishes in a kitchen. 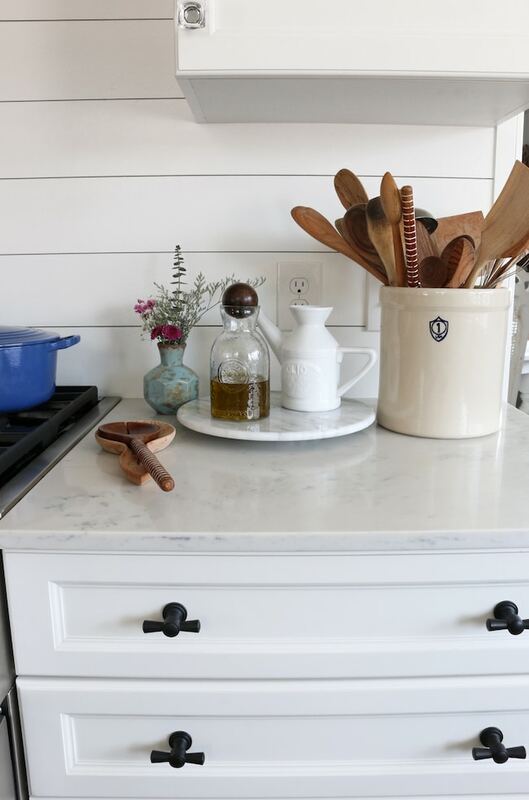 The reason I like a mix is 1) it feels less formal and more interesting to me 2) the mix keeps the kitchen feeling fresh and timeless. 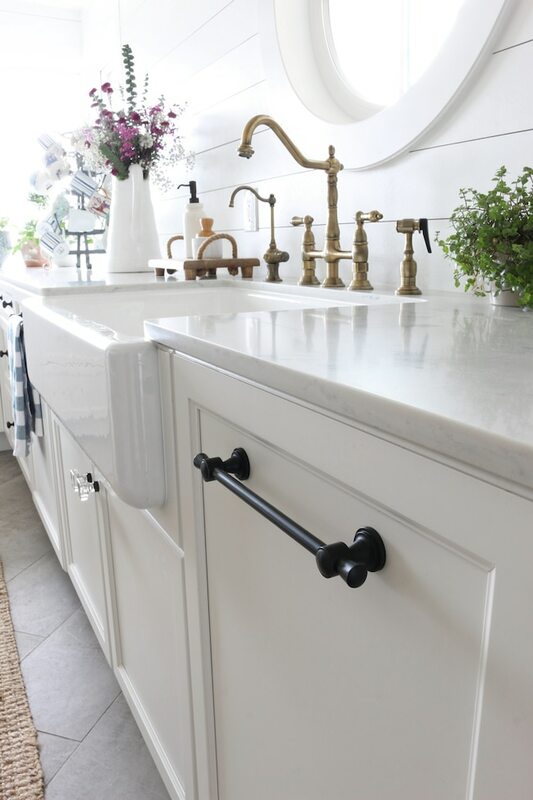 Even in a small kitchen, we managed to fit in several different types of hardware (in addition to the antique brass finishes found on our faucets and sconces). UPDATE: I wrote an entire post about how we selected hardware! Read it here. 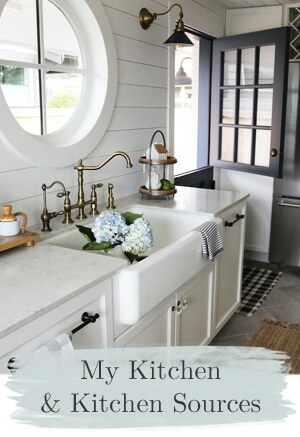 You can click through the thumbnail photos below to see kitchen sources. 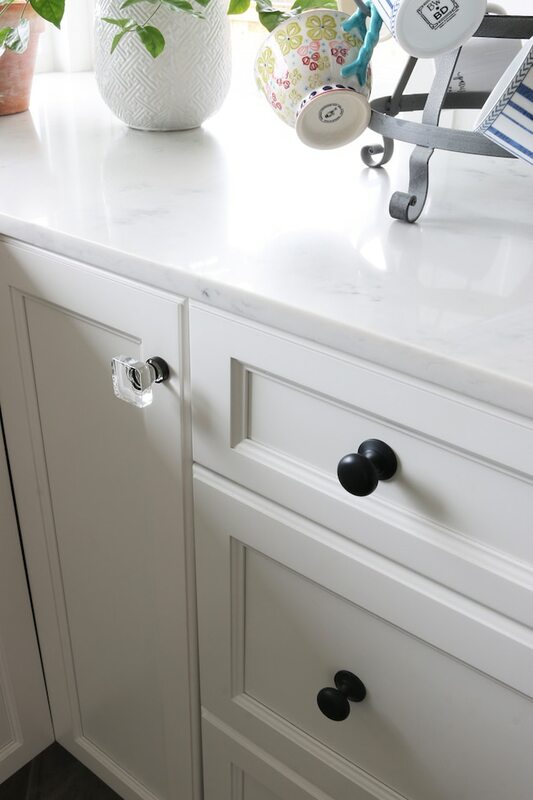 We have the set of two round black drawer hardware on most of the drawers, a different shape of black pulls on the top four smaller drawers near the stove, two long black pulls which double as towel rods on the dishwasher and trash drawers), square glass knobs with black brackets on the cabinet doors, and two slim brass edge pulls on the pantry cabinets. 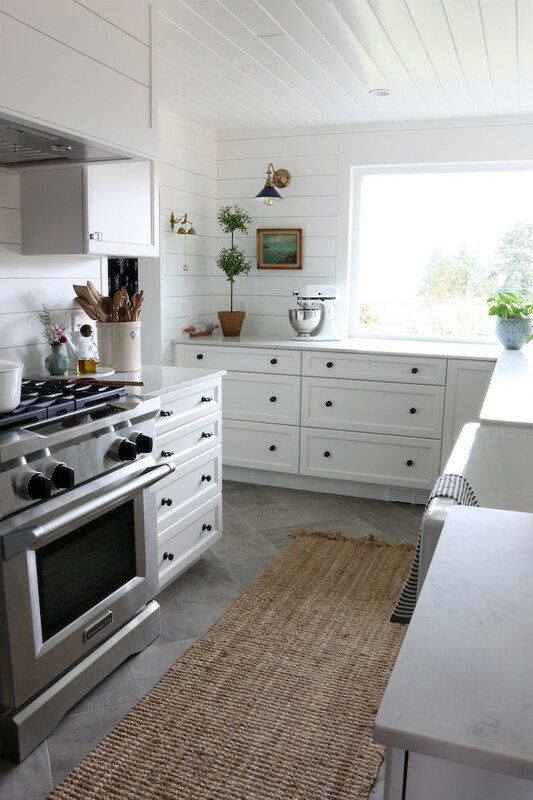 I’m so happy with the cleaner look of no upper cabinets or soffits on this side of the room, it really opened up the view to the corner windows. We sold the old stove to someone who was going to have it repaired and restored. Our new range is amazing. I am so glad we left this wall where it was so we have room for proper ventilation over the range and counter space on both sides, too. I can’t even. 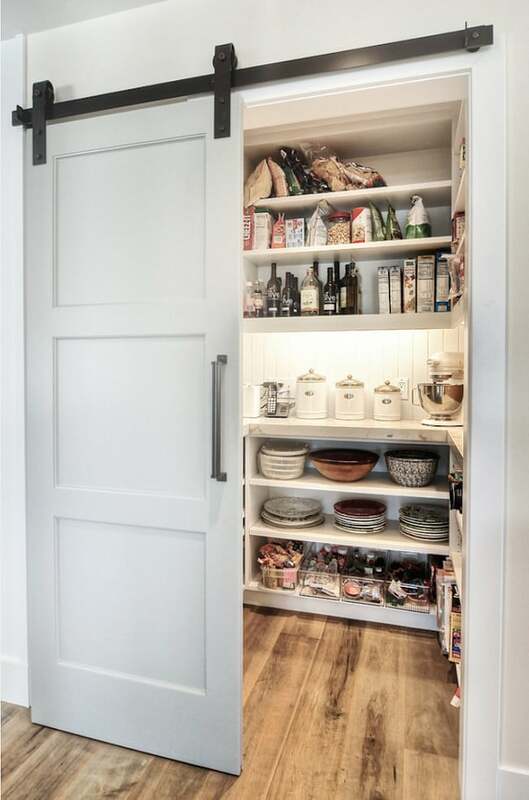 This door is my dream come true. 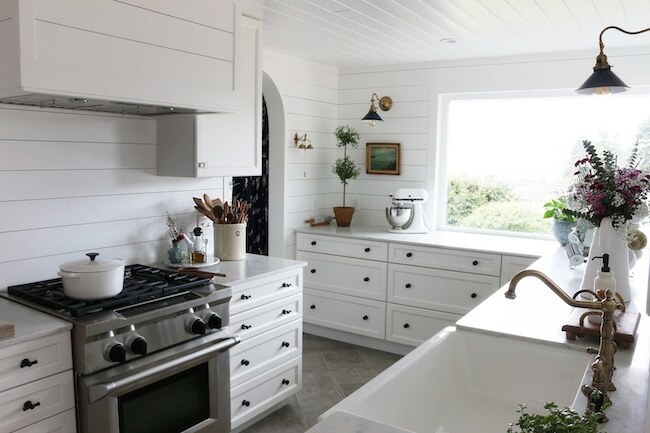 I love this long counter that wraps all the way around the back wall. It feels so good to work here without cabinets in front of your face, too. We’ve used it many times for buffet set up, too, and it works great! 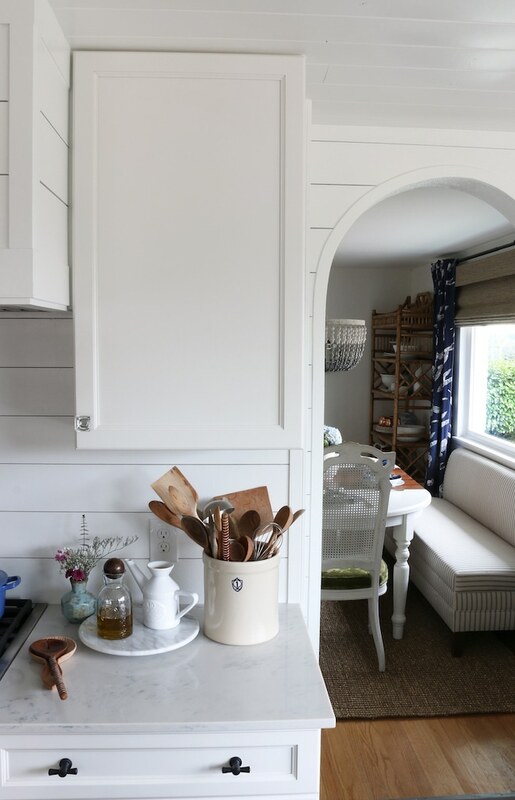 It’s still a “smallish” kitchen, but it sure feels like it grew in function, storage and counter space! 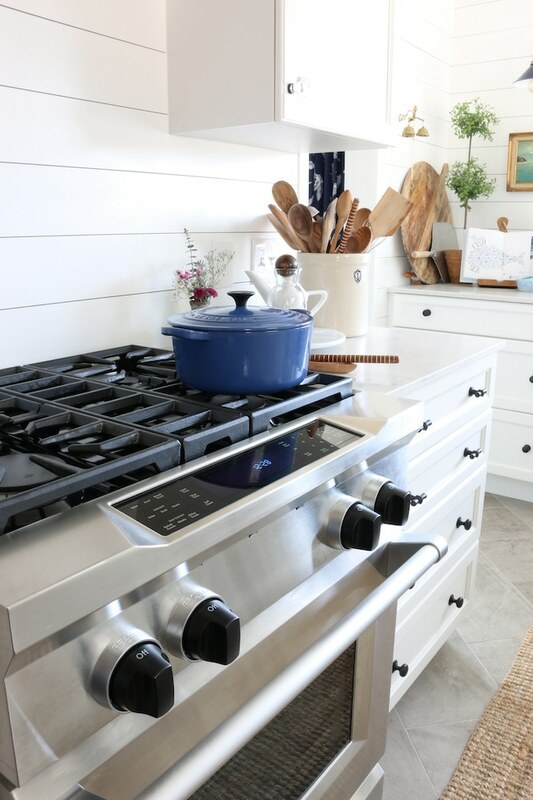 Thank you to KitchenAid® for providing the appliances for this project. 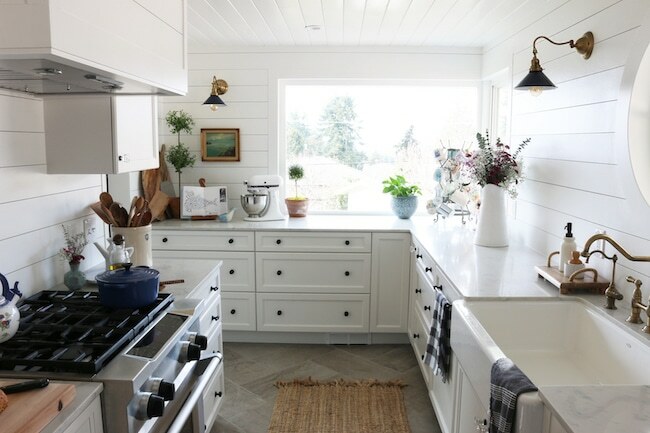 Find the KITCHEN SOURCE LIST here! 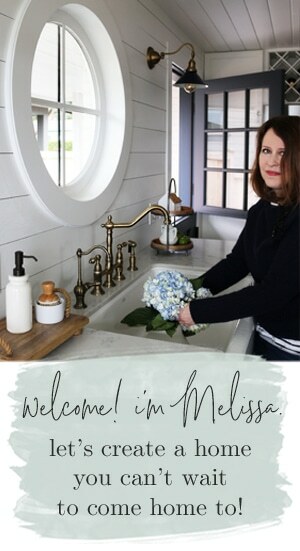 Thank you so much for coming by today for the kitchen reveal! I hope you enjoyed it :). 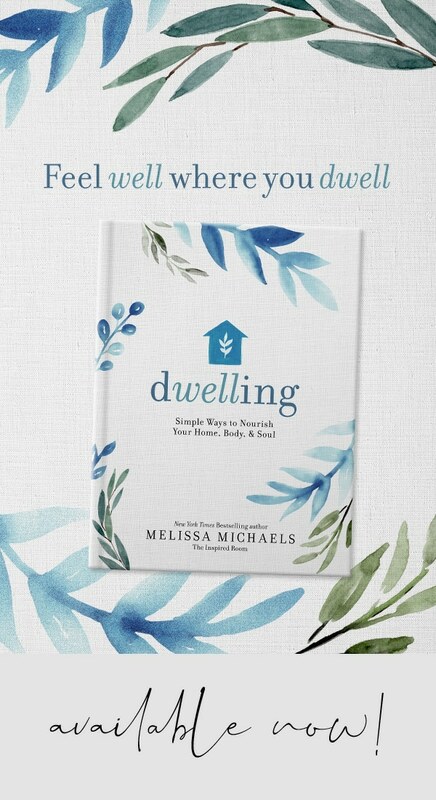 If you are new here, I hope you’ll follow along as we make this house our home! 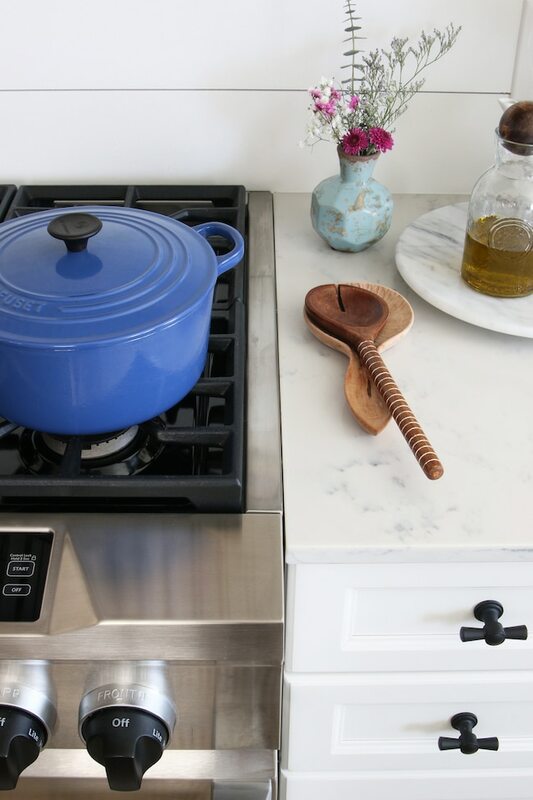 Where Do You Store Your Dishes? 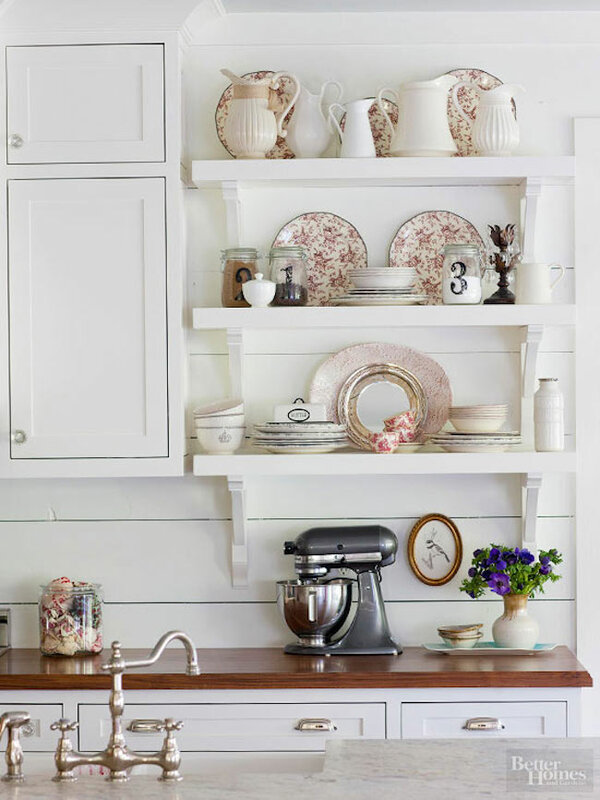 Do you love to collect dishes? 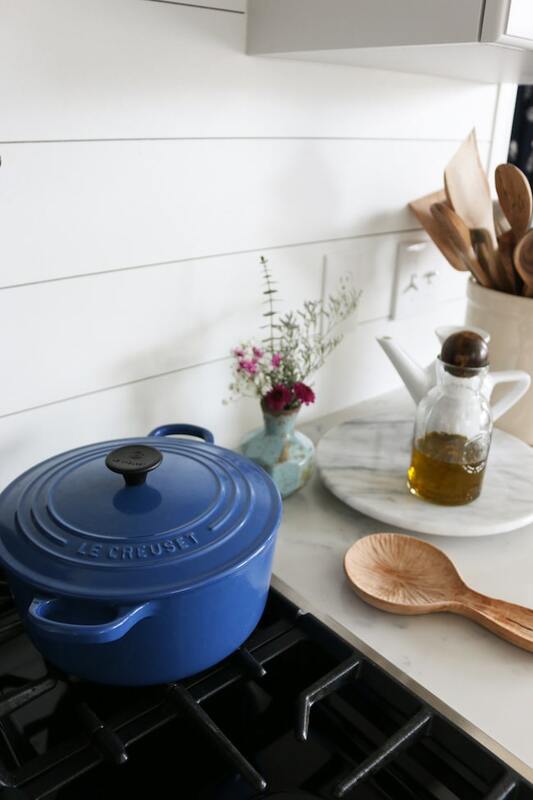 You might have seen in my “Life Lately on Instagram” post that I bought some new blue and white dishes. 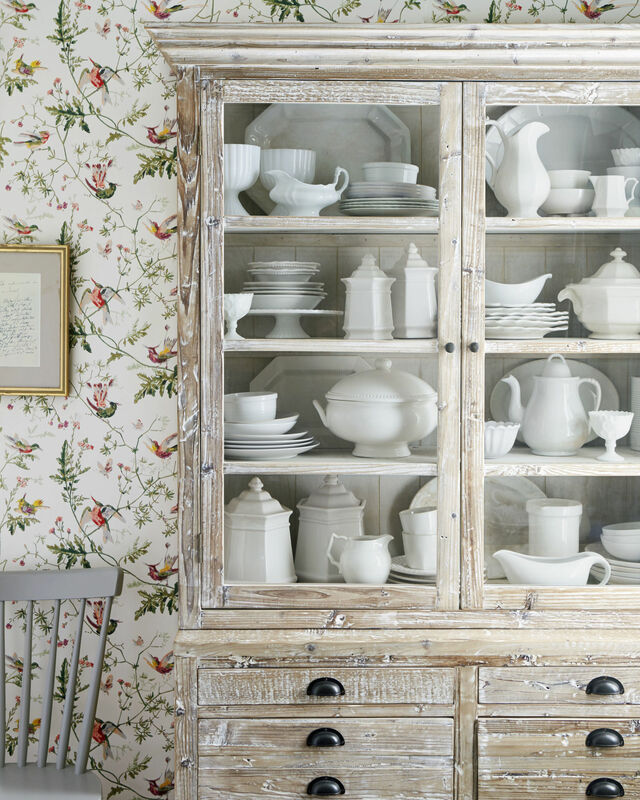 I’ve always collected mostly white, with the exception of some colorful mugs and salad or dessert sized plates. It is fun to have a new set to play with! 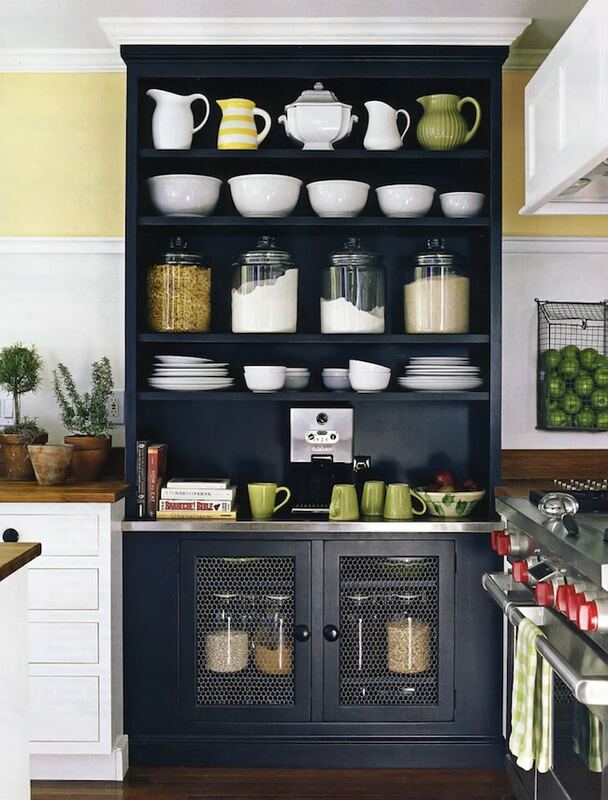 If you have a huge kitchen, you probably can fit everything in your cabinets. 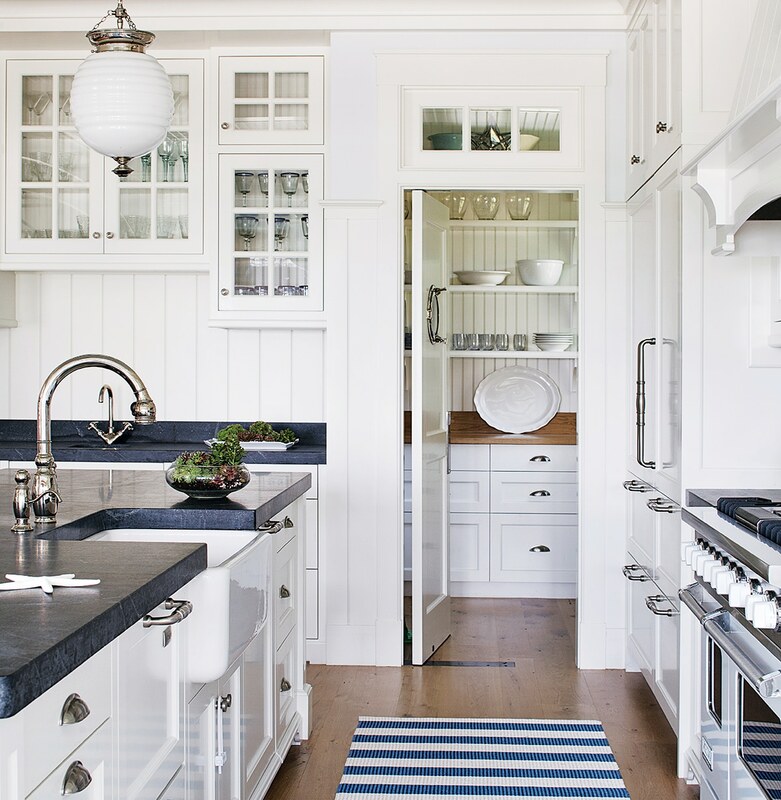 But if you have a little kitchen like me, you’ll probably need some overflow cabinets somewhere. Yes, you could just pare down and have only enough for your everyday needs. But what fun is that? Of course, it’s not fun to have too much stuff you don’t use, either. It’s best to only keep what you really love and use. 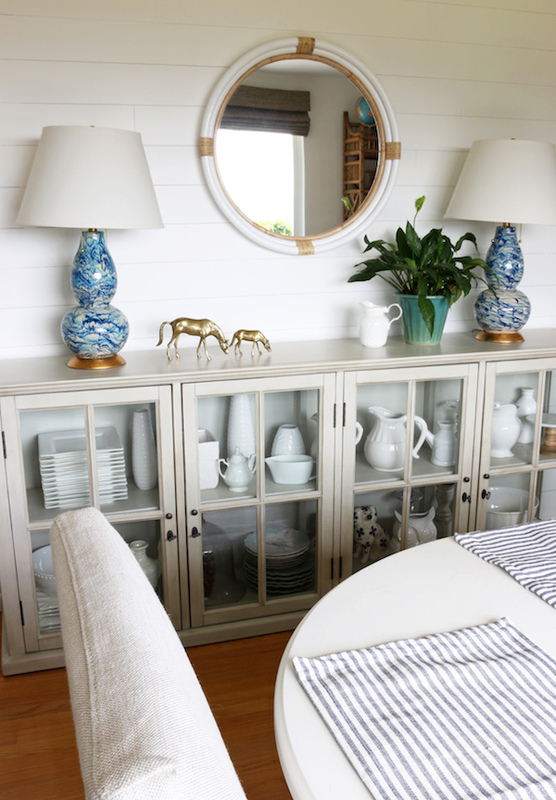 But if you do enjoy setting a table, where do you put all your favorite surplus dishes, serving bowls, and pitchers? 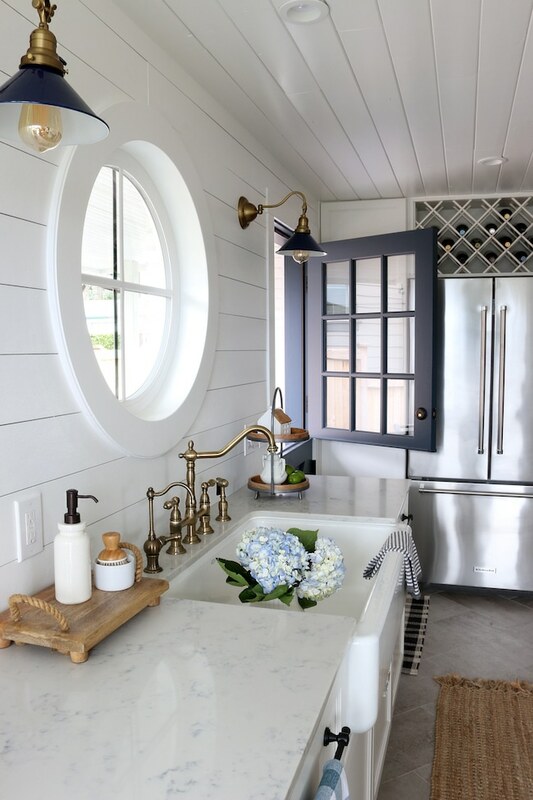 Even in a small house you can probably get creative and find a way to tuck them in somewhere! 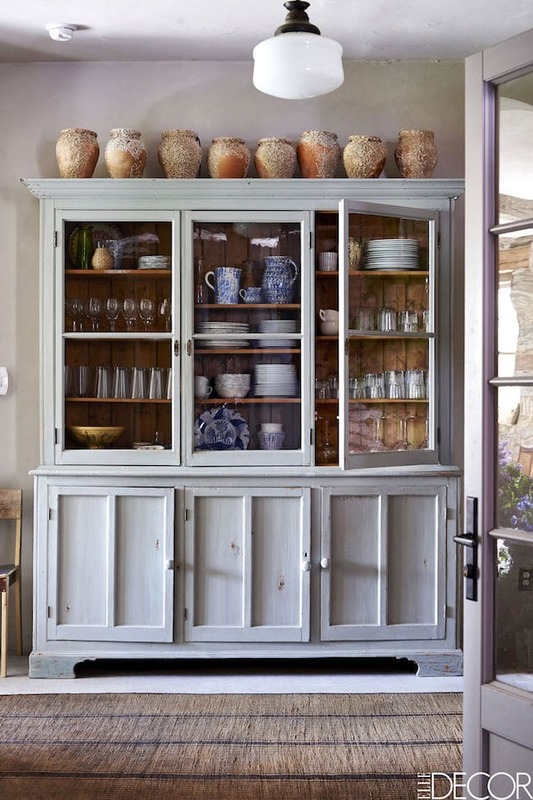 Today’s post has inspiration for closed cabinets, freestanding buffets, built-ins and pantries, shelving, and charming china cabinets. Enjoy! 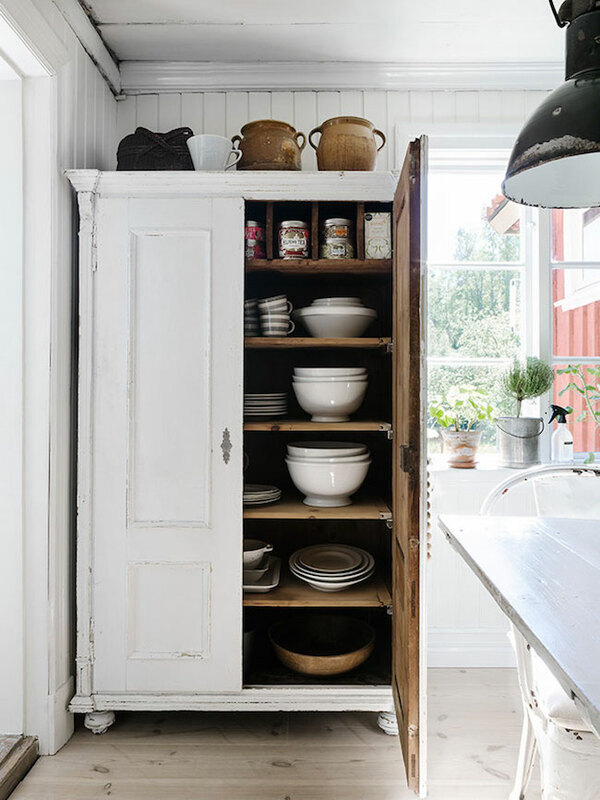 Where do you keep extra dishes? 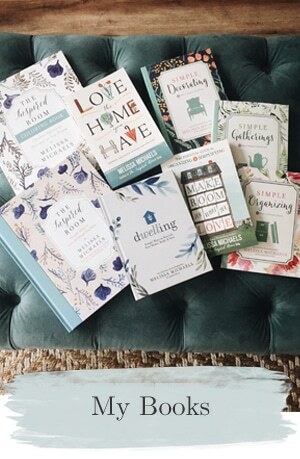 Be sure to read Make Room for What You Love for motivational ideas for simplifying, organizing, and making room for what matters to you!